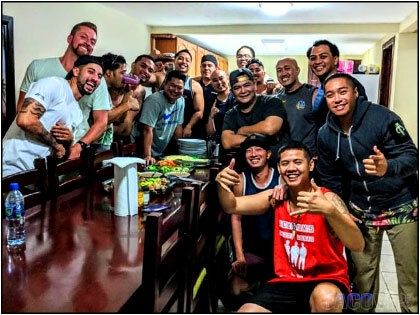 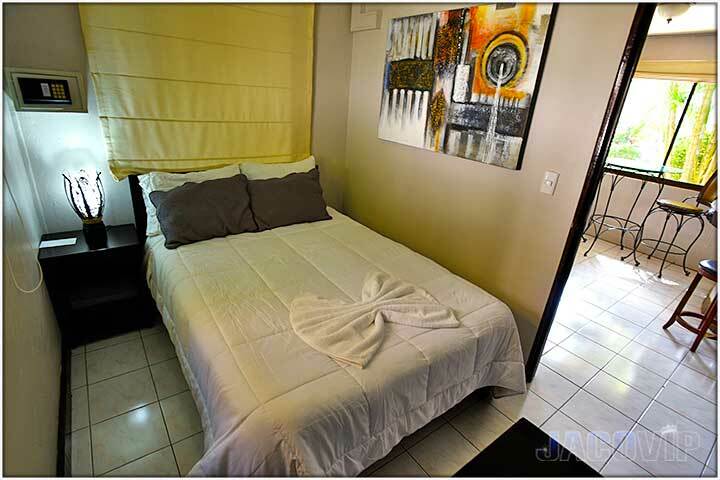 TOTAL OF 15 BEDROOMS / 16 BEDS • MAXIMUM OCCUPANCY IS UP TO 22. 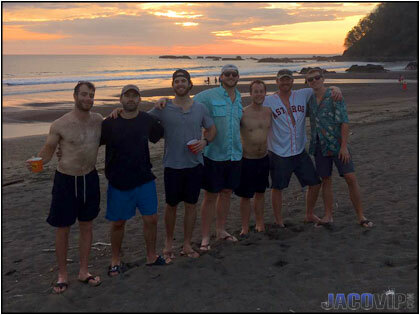 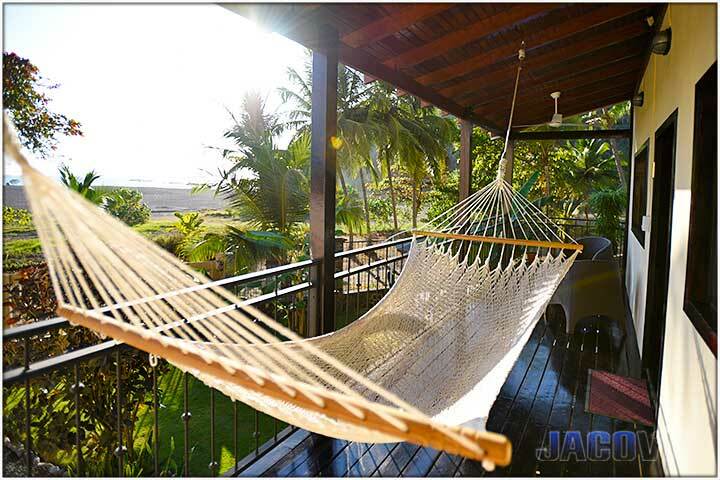 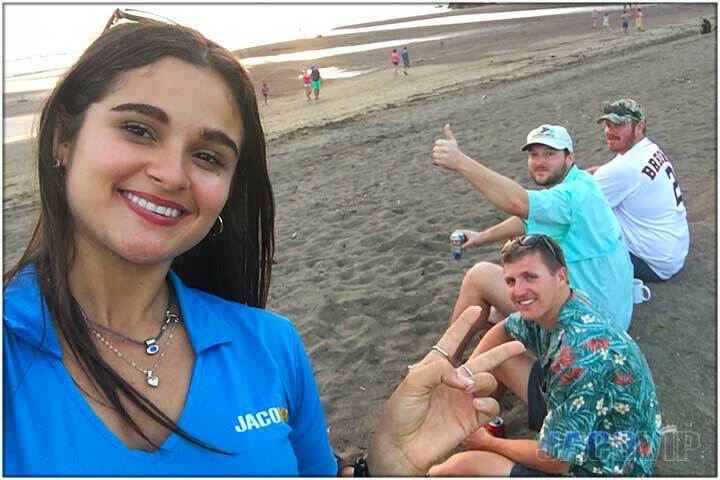 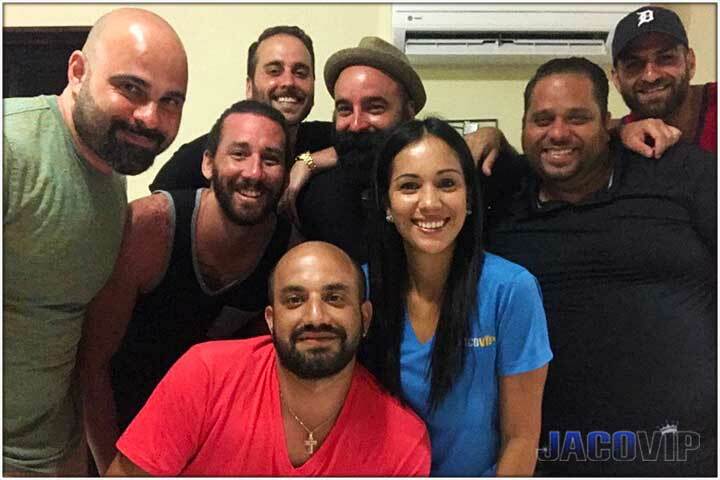 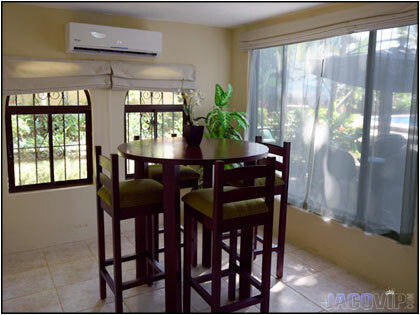 LOCATION: Directly on Jaco Beach, at the north end. 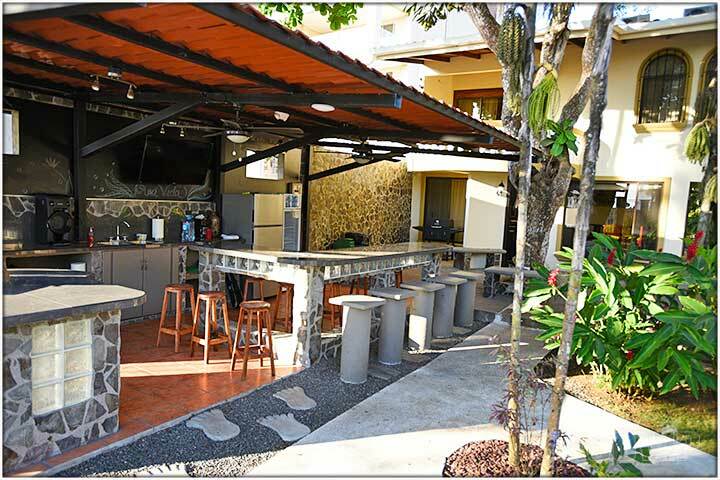 Next to Croc's Casino, local bars, restaurants, etc. 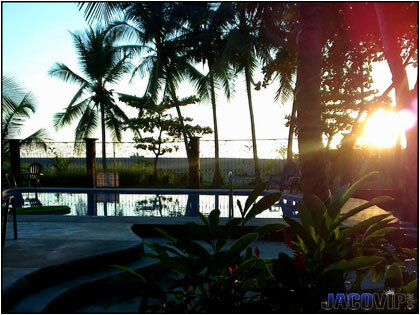 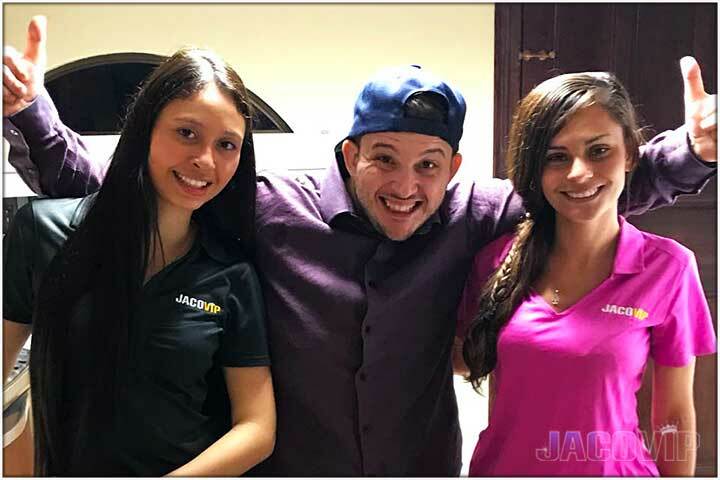 Less than 3 minutes to Jaco center. 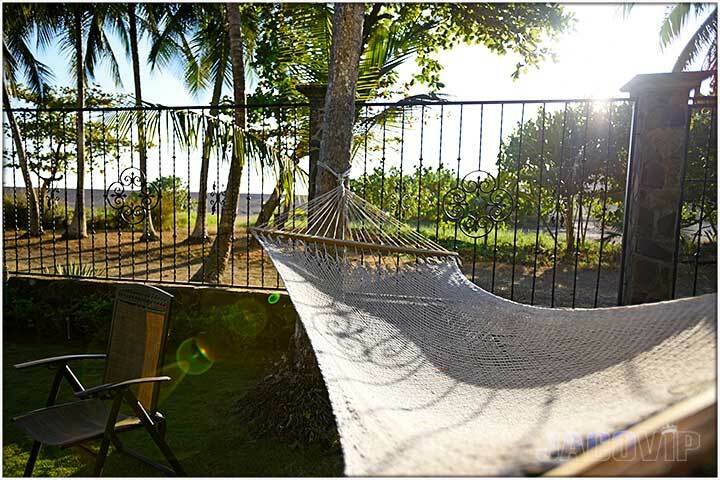 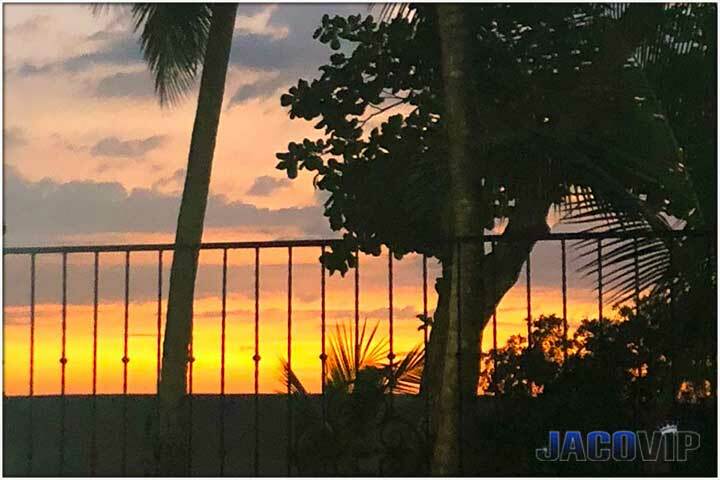 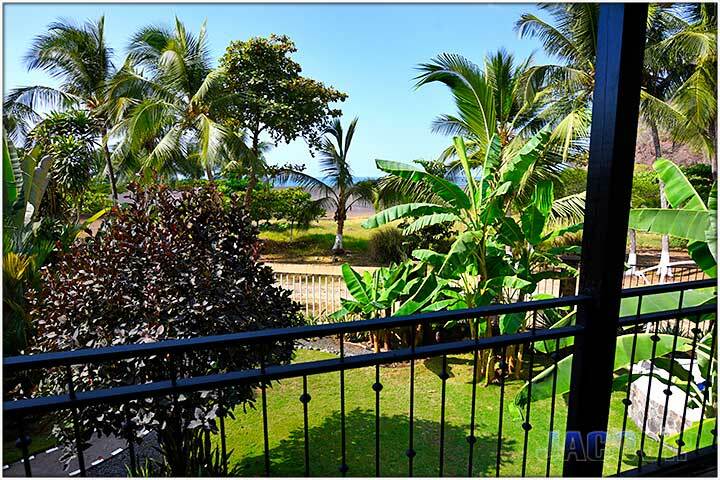 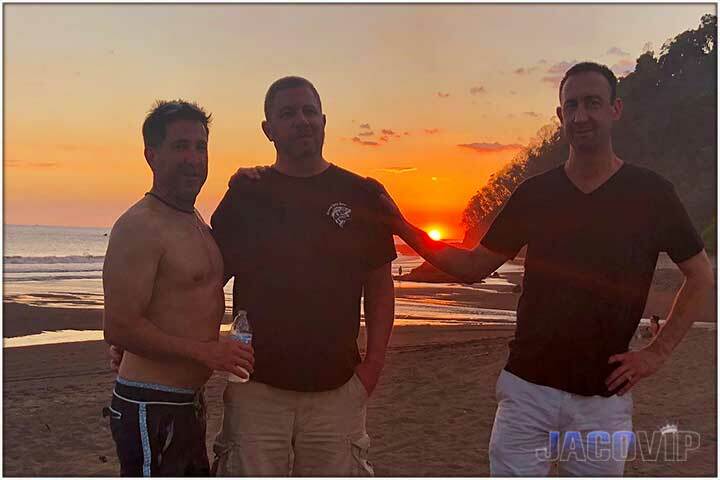 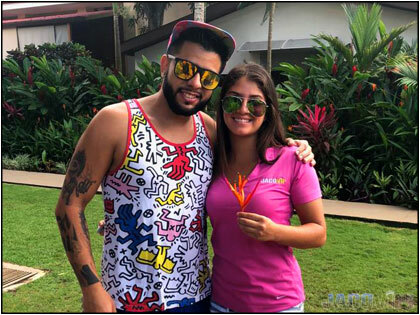 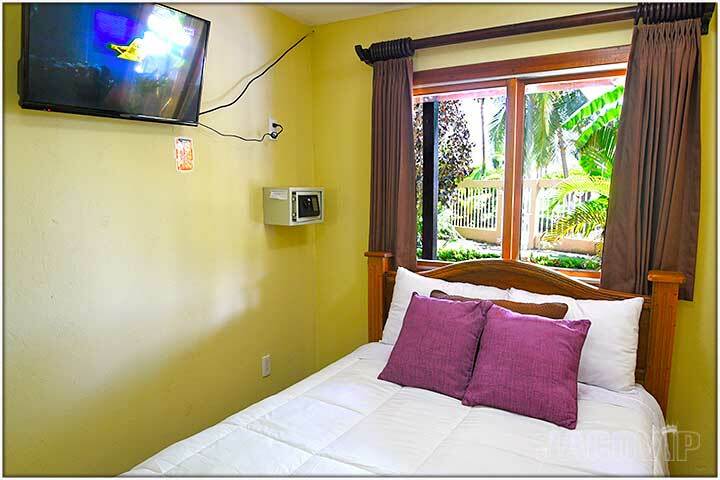 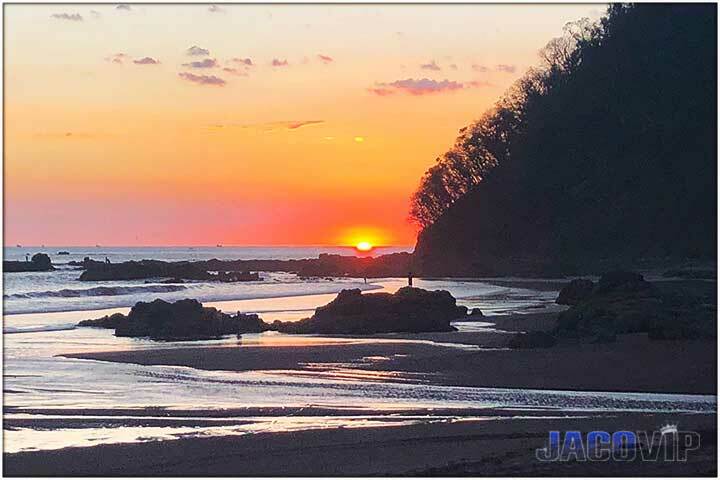 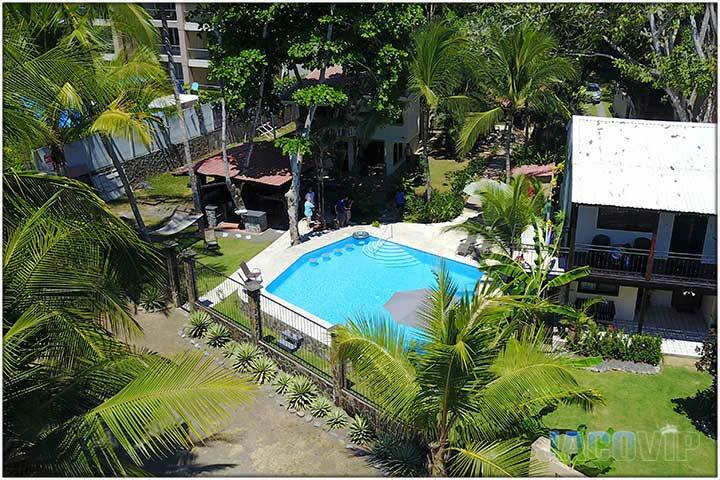 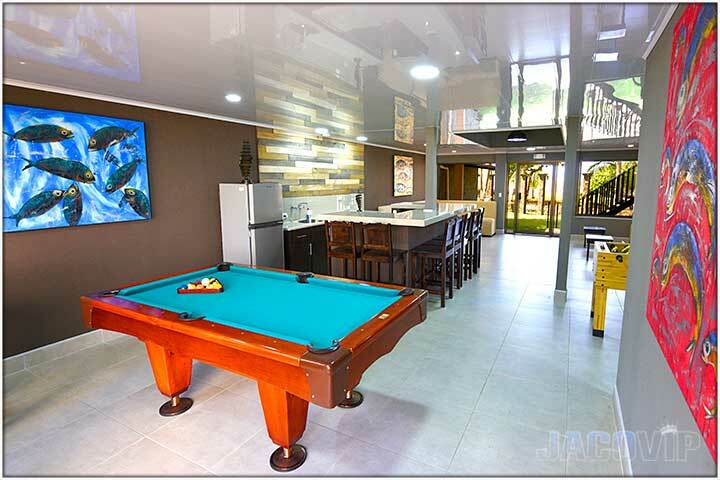 ACCOMMODATIONS: Serenity Point Beach Front Property includes Private Night Club, Game Room, Outdoor Rancho, Beachfront Balconies, Swimming Pool and amazing gardens all on one full acre that offers spectacular sunsets. 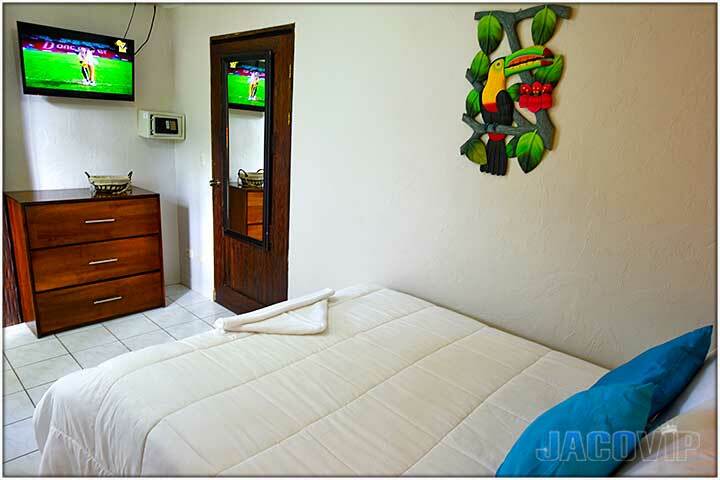 Property consists of 4 Houses with a total of 15 Bedrooms [All bedrooms have A/C, TV, and a Safe Box]. 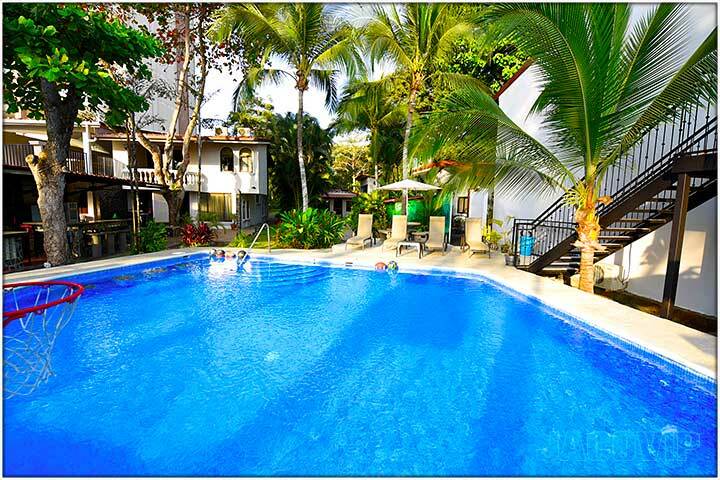 Total of 16 Beds / 10 Full Bathrooms + 2 Half Bathrooms near the pool. 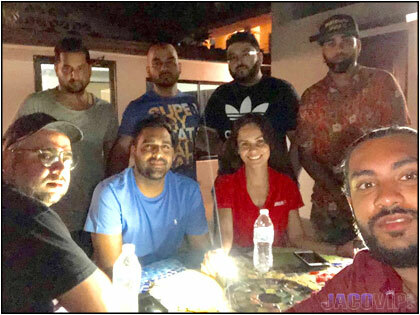 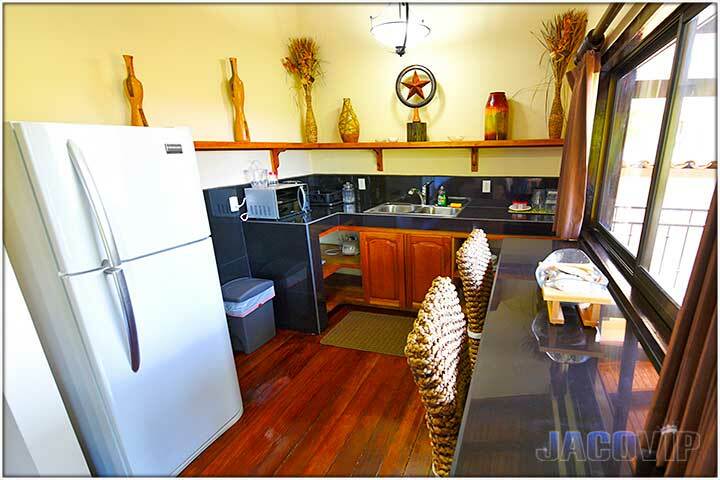 Price listed up to a max occupancy of 18 people. 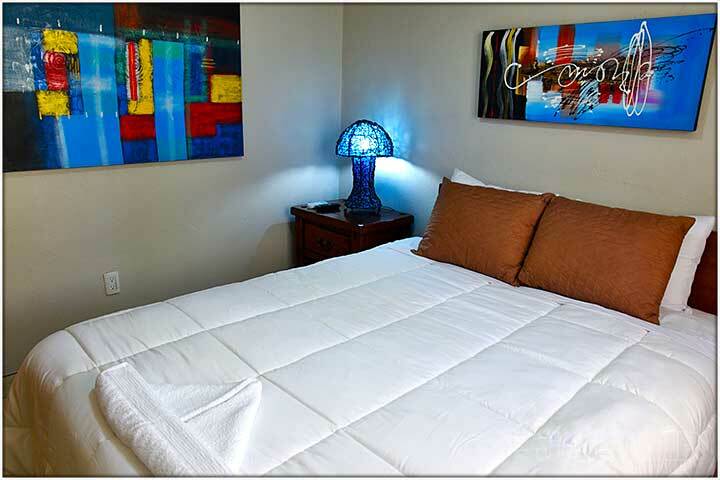 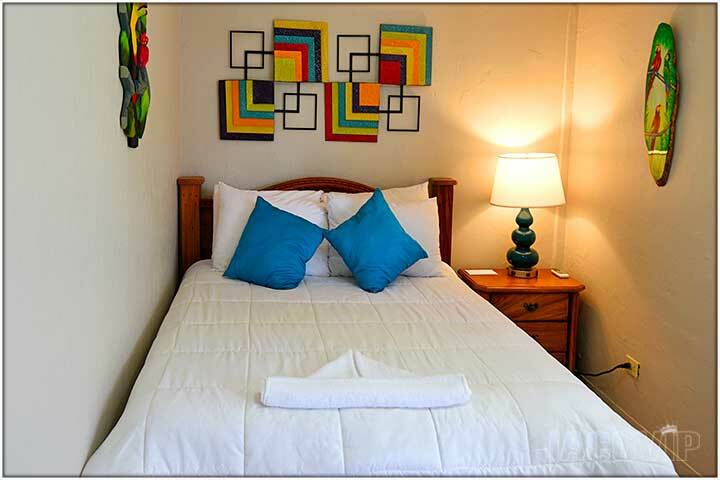 For groups over 18 people, add $30/person per night, up to a total maximum occupancy of 22 people. 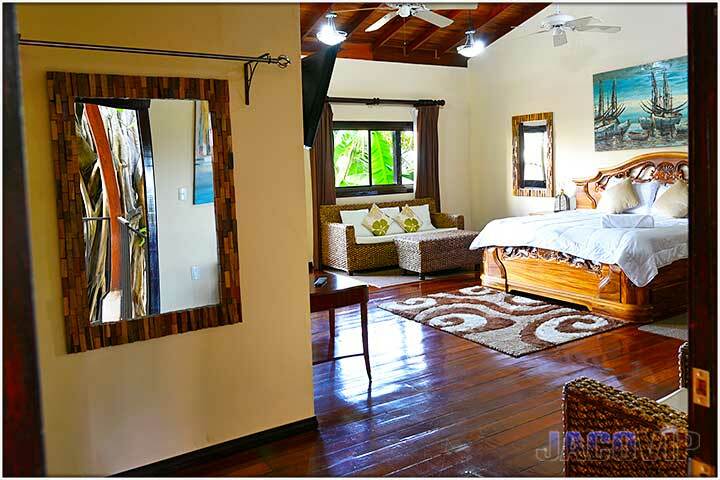 Casa #1 includes the second floor “Beach Front Master Bedroom” which is a large and impressive loft-style studio that boasts high ceilings and includes a private bathroom, kitchen & lounge area, and a beachfront balcony that offers amazing views of Jaco Beach and the Pacific Ocean. 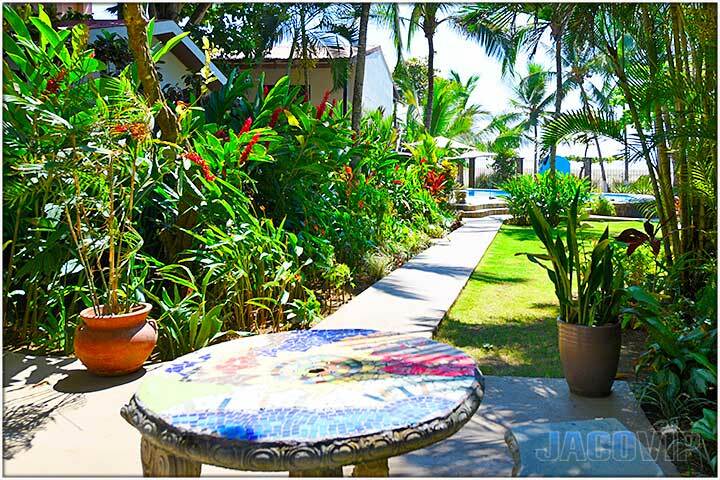 The ground floor has 2 more bedrooms and a small kitchen & lounge area which leads out to a courtyard that directly on Jaco beach. 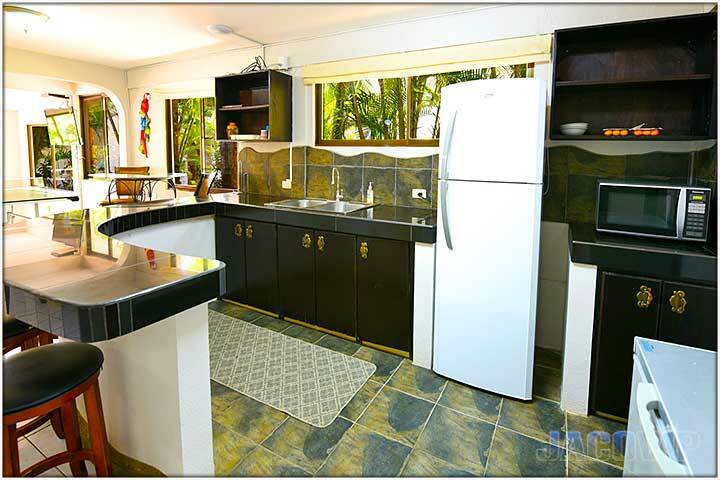 Casa #2 includes the fully-equipped kitchen (ideal for private chef service.) 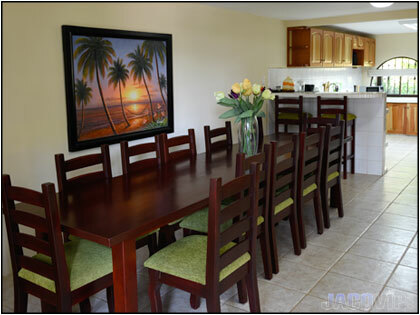 There is plenty of seating for all guest at the dining table that seats 12, plus the high-top table that seats 4 and the bar stools facing the kitchen. 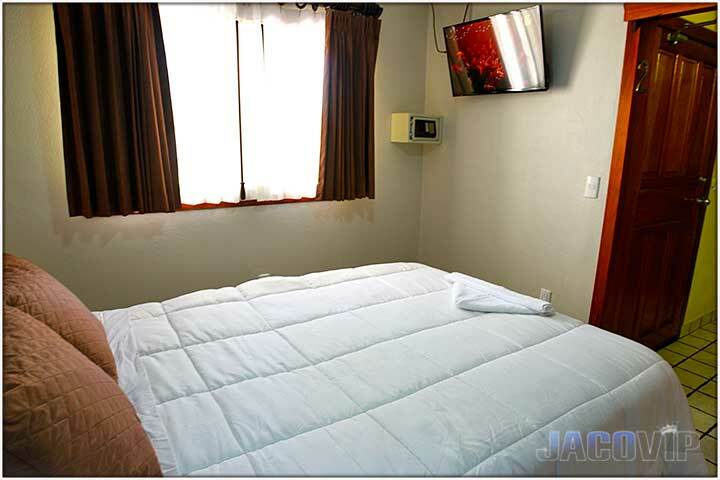 Included in this area is AC and a TV. 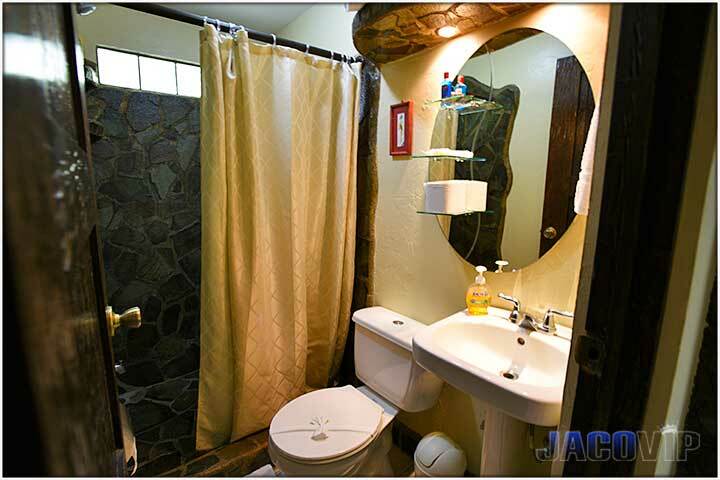 The first floor includes a full bathroom, and a private bedroom. 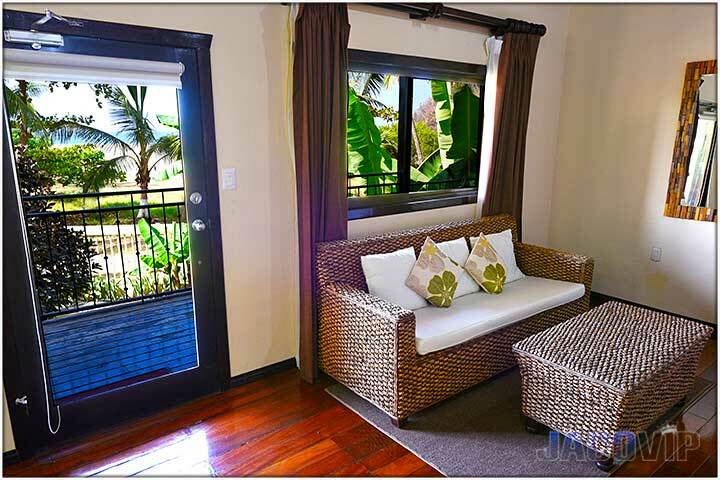 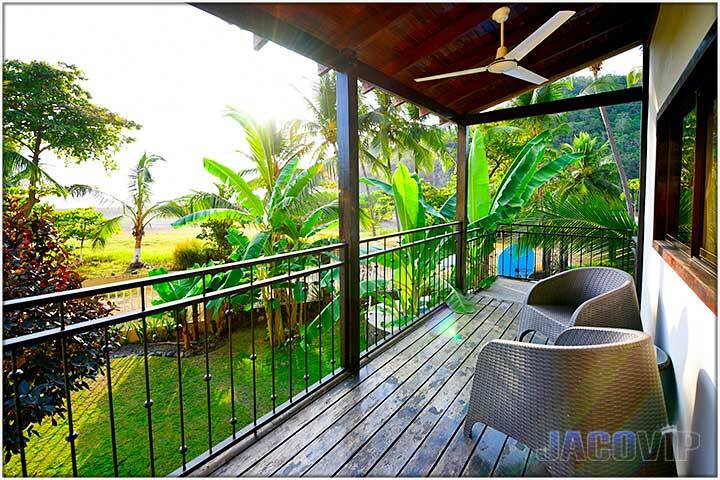 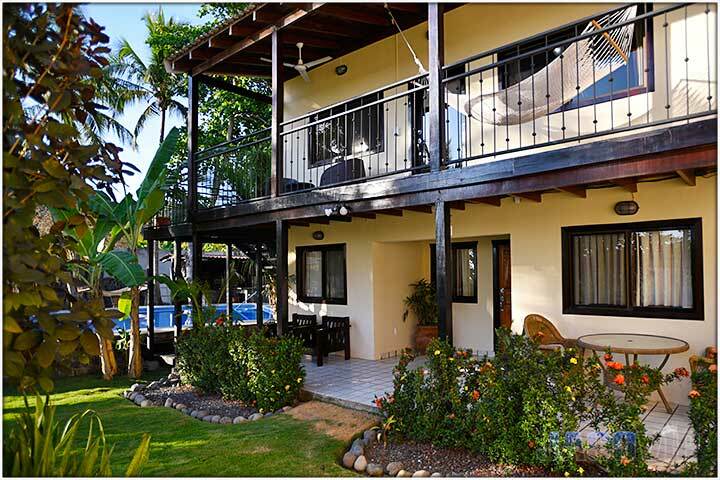 Upstairs are two more bedrooms with beach views, a full bathroom, and a small lounge area. 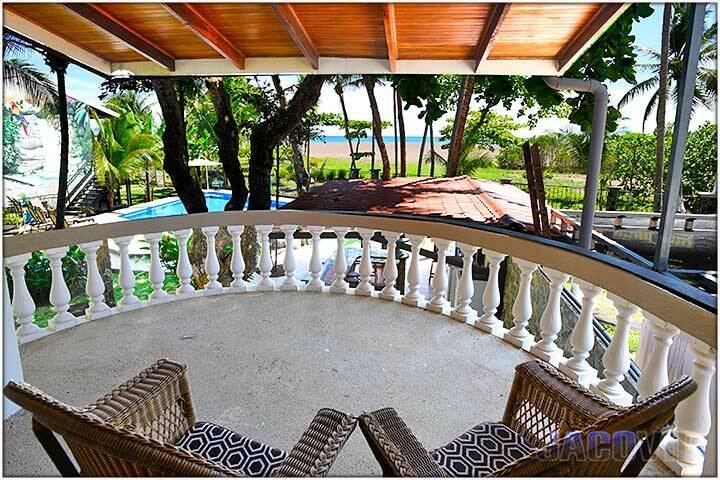 There is a half-moon balcony that offers amazing views of the swimming pool, rancho and onto the Pacific Ocean. 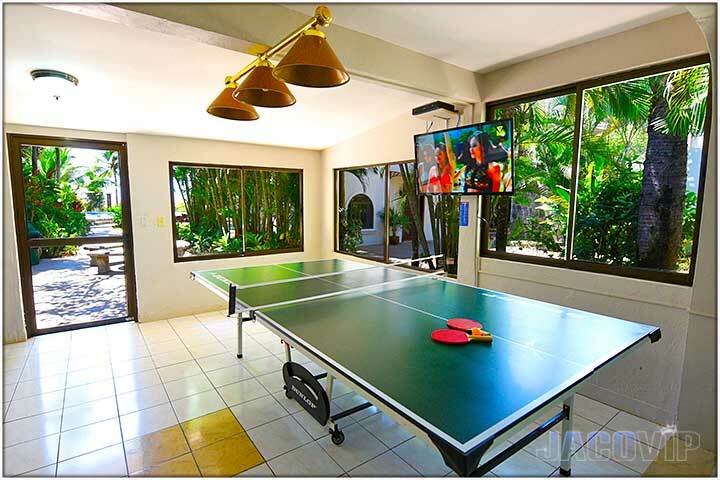 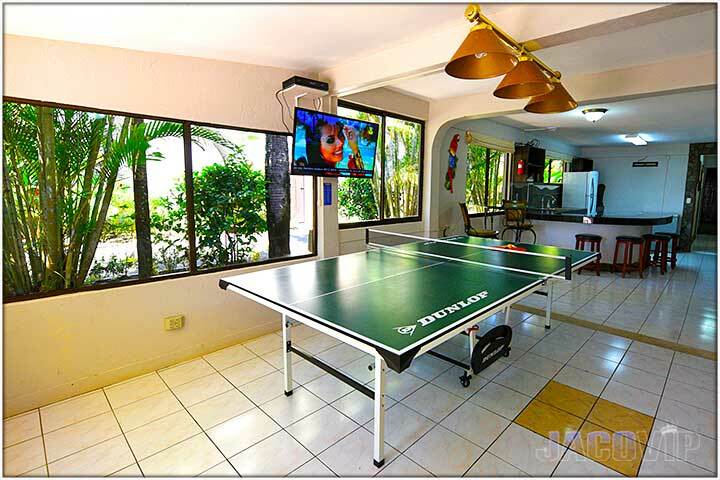 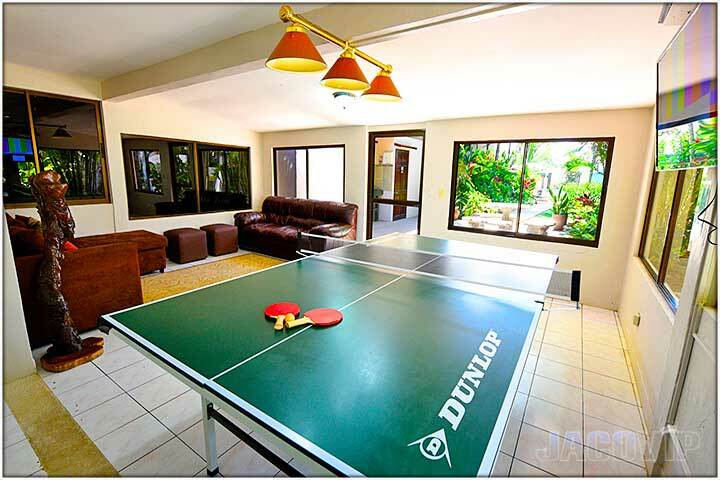 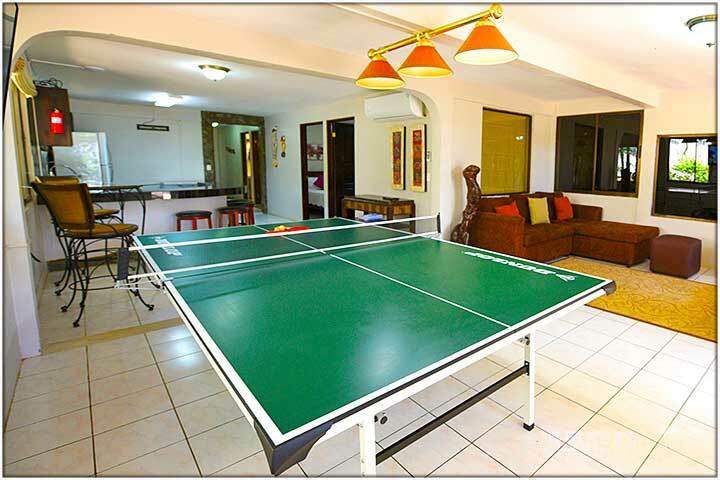 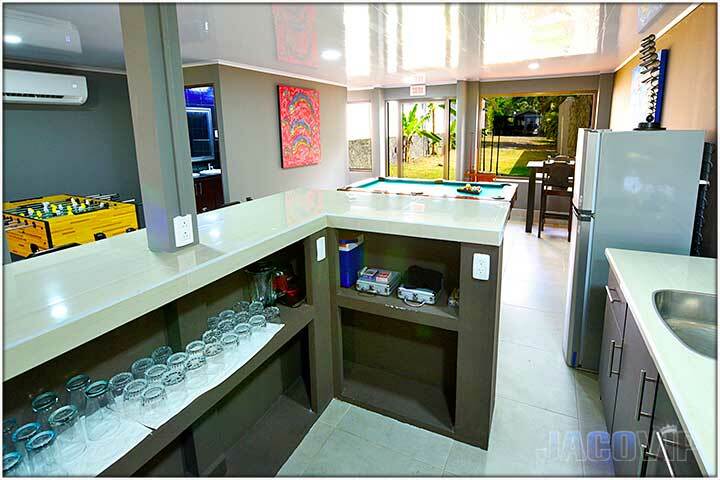 Casa #3 includes a Newly Refurbished Game Room with ping pong table, sofas, TV, and a bar with fridge, blender, sink, bar glasses etc... 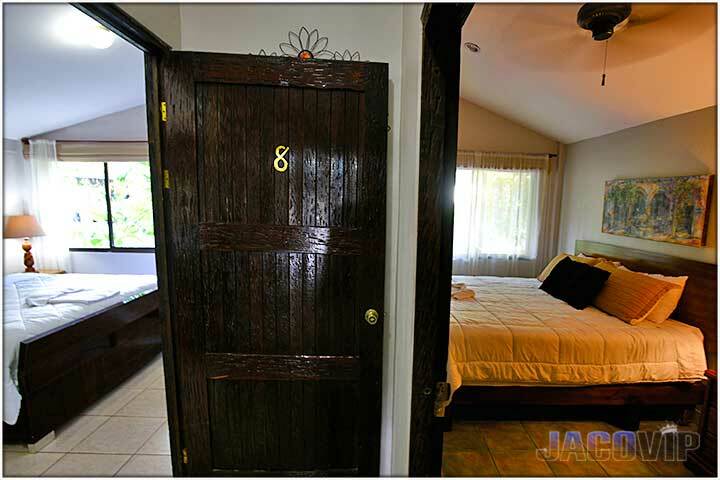 There are 5 Bedrooms in this house. 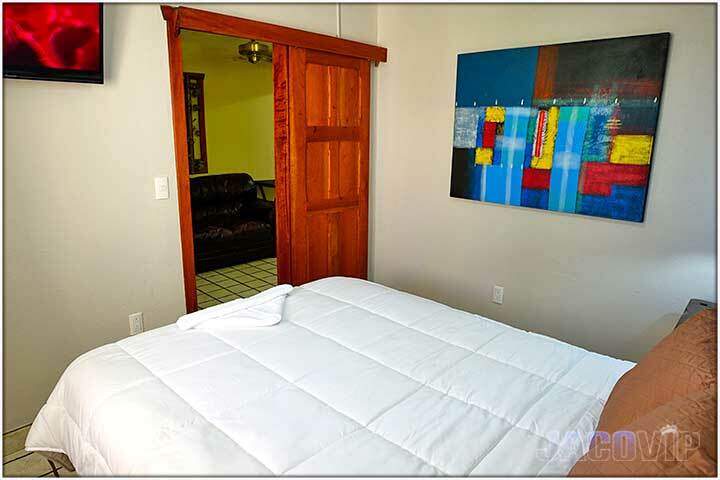 Two of Bedrooms offer a King Size bed, Private Bathroom and Private entrance to the outside. 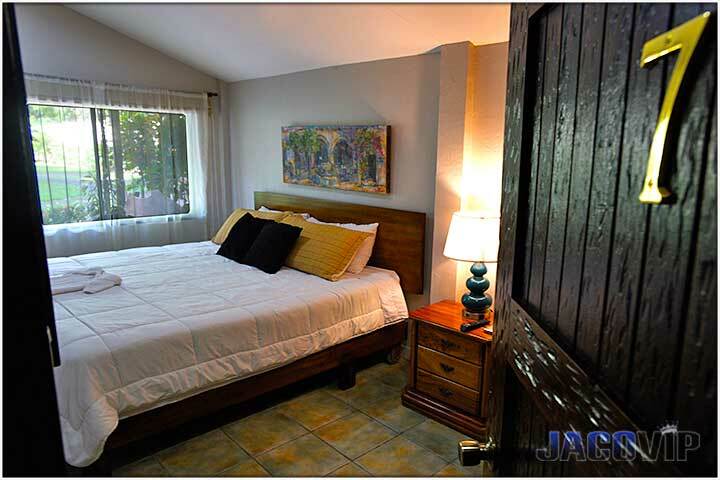 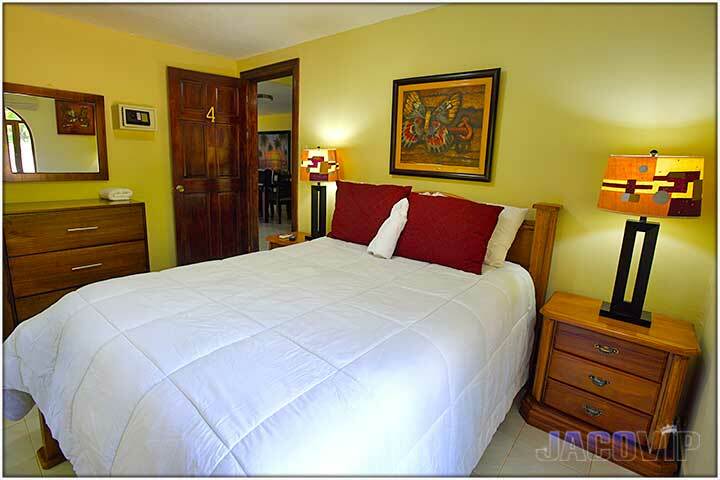 The other three bedrooms offer double size beds and share two additional bathrooms. 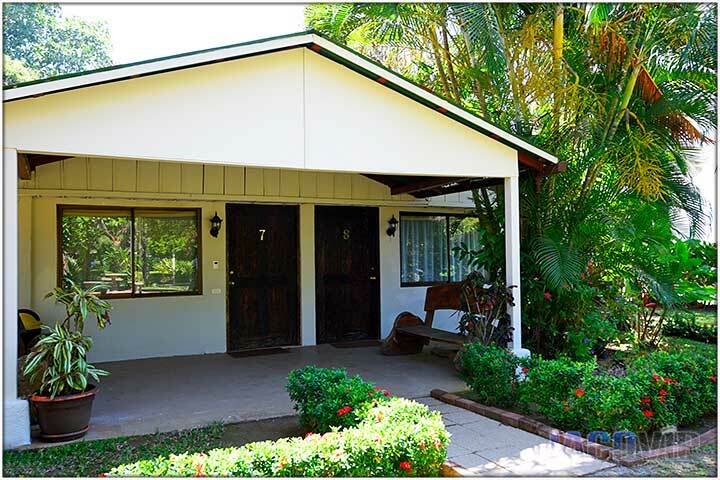 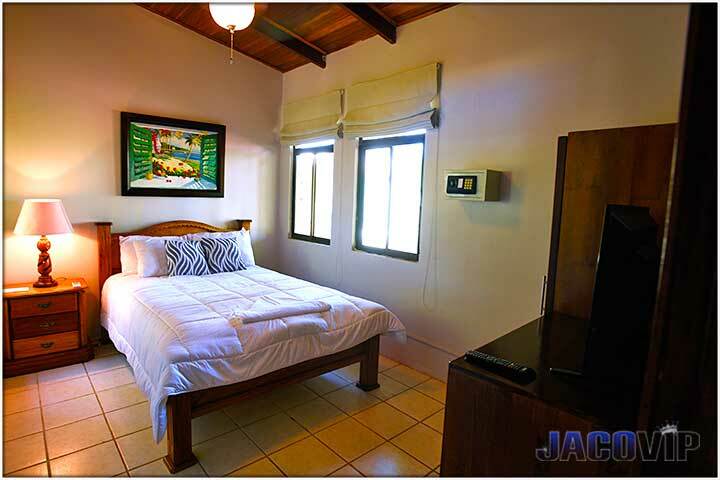 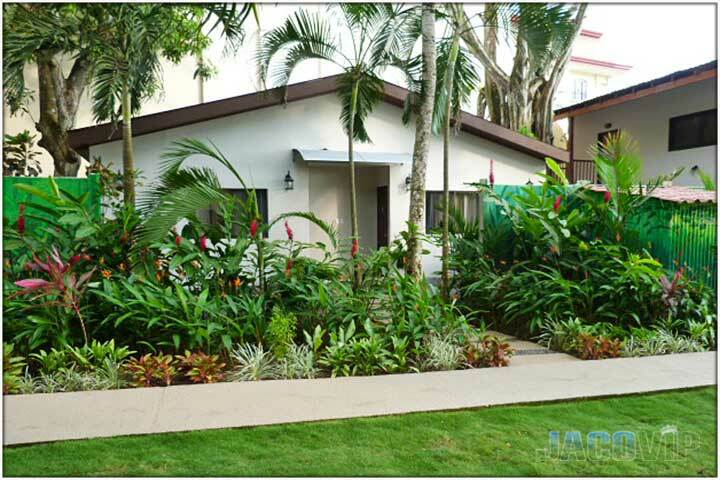 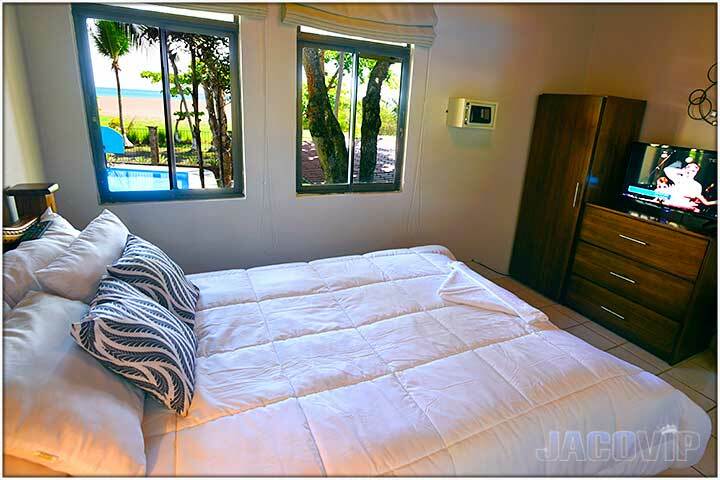 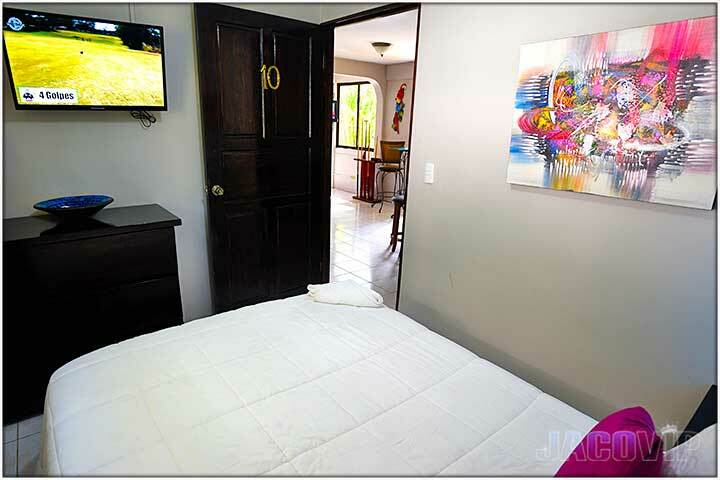 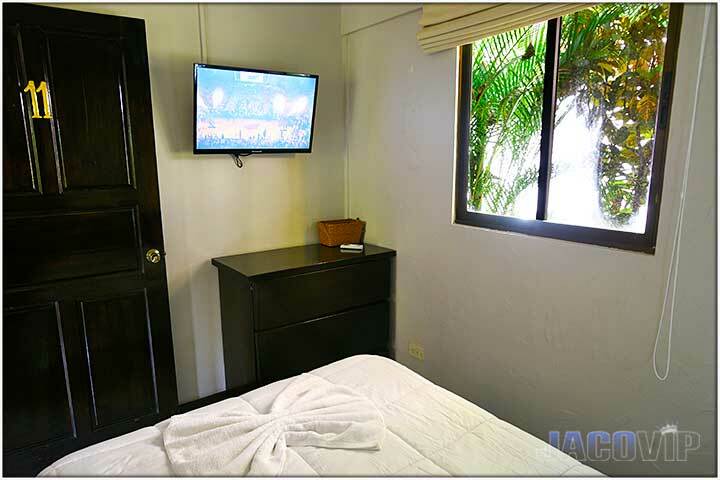 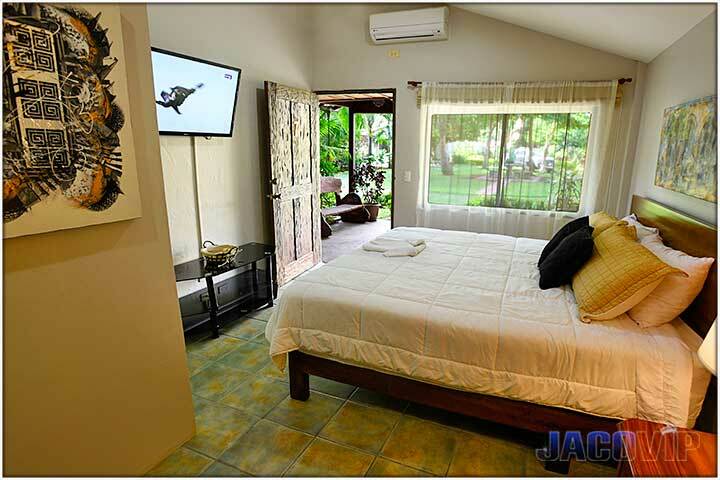 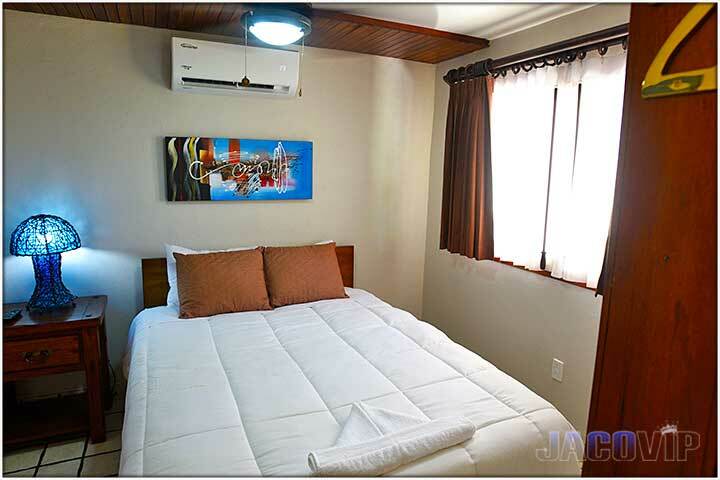 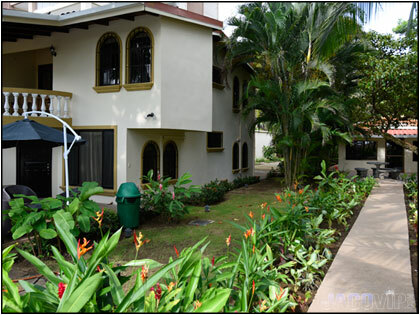 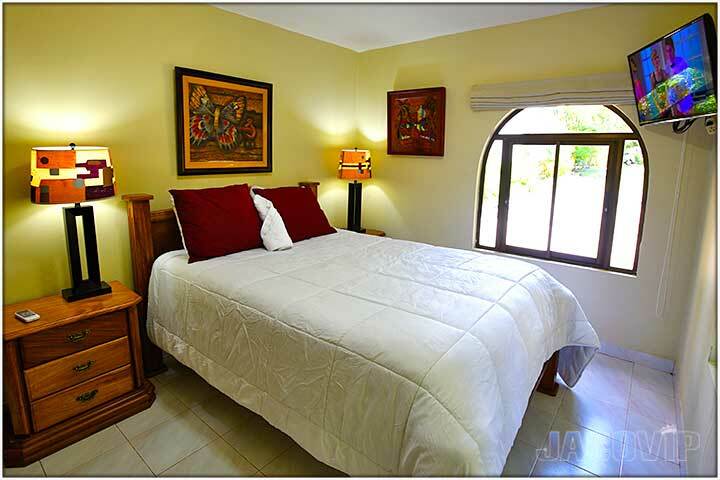 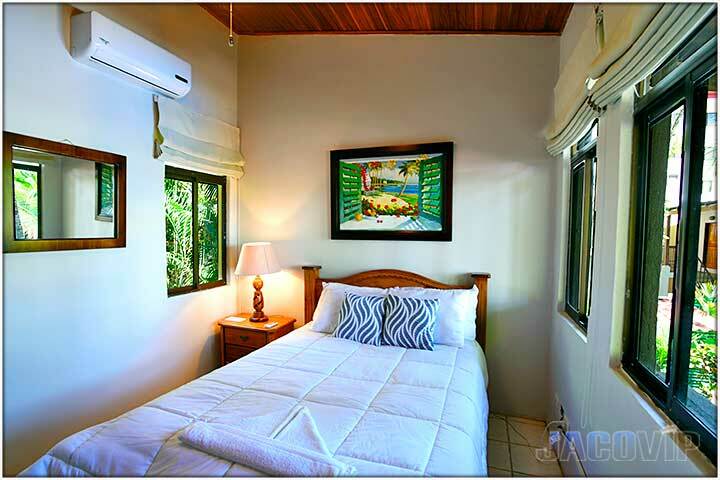 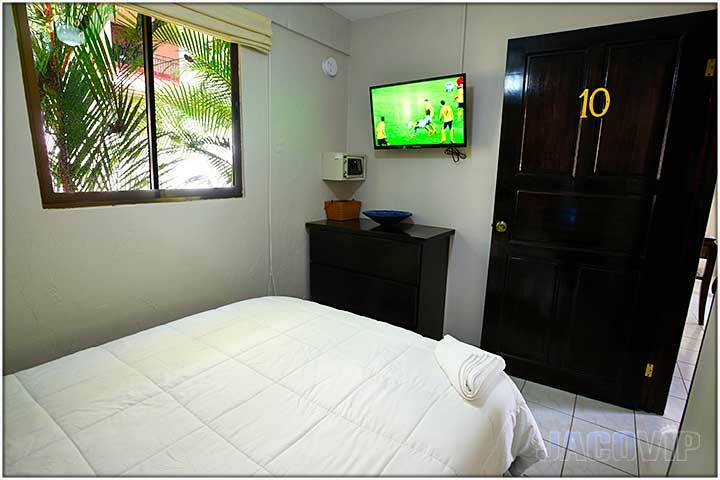 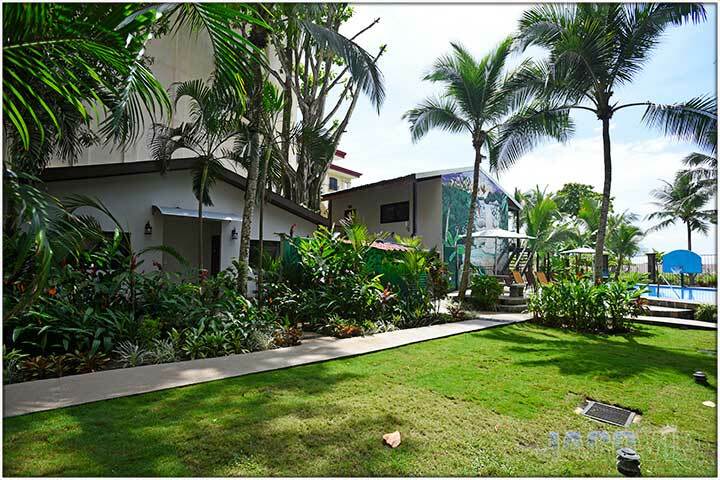 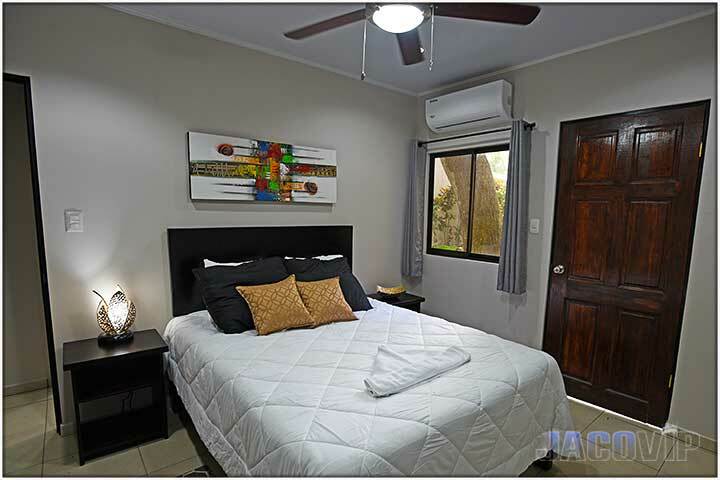 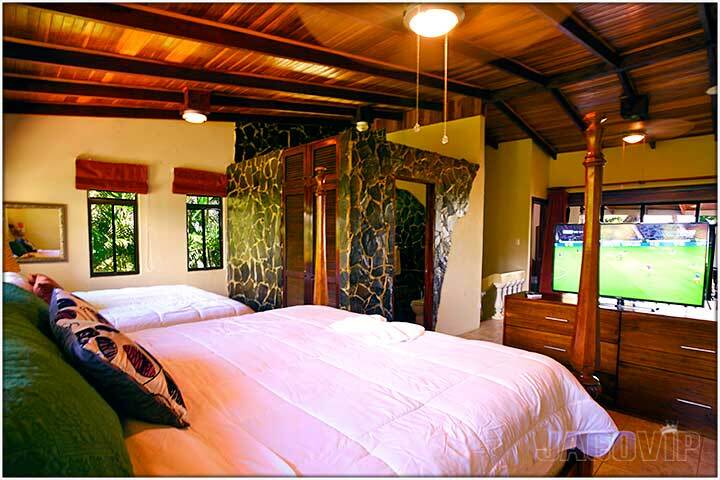 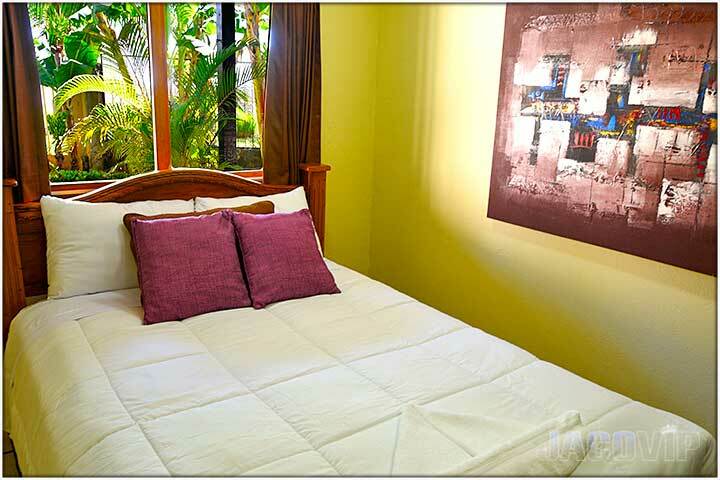 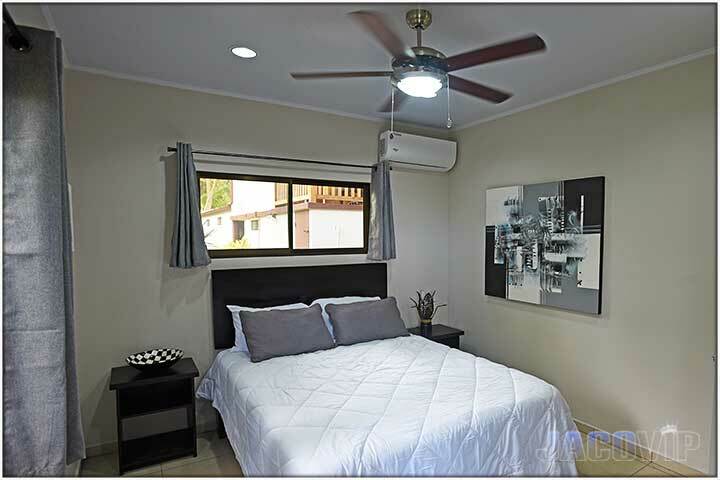 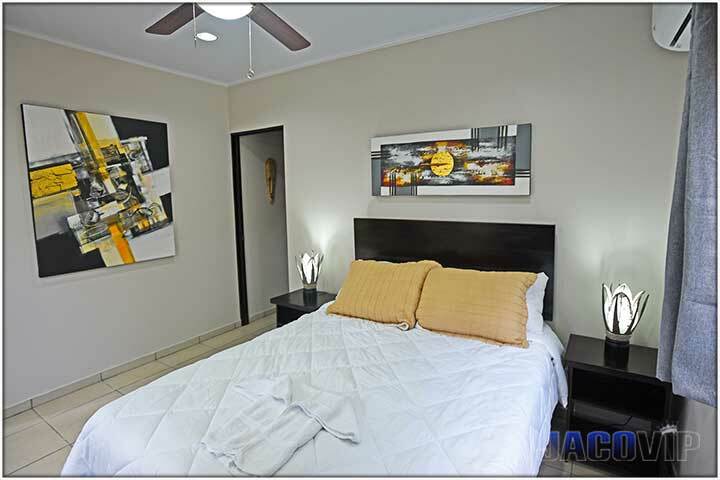 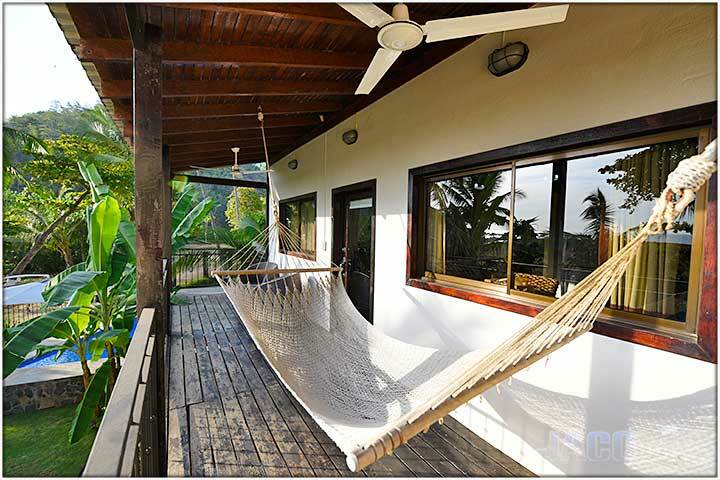 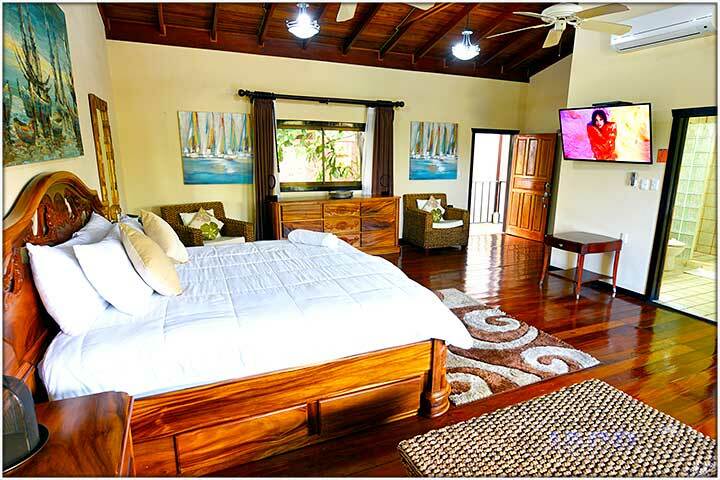 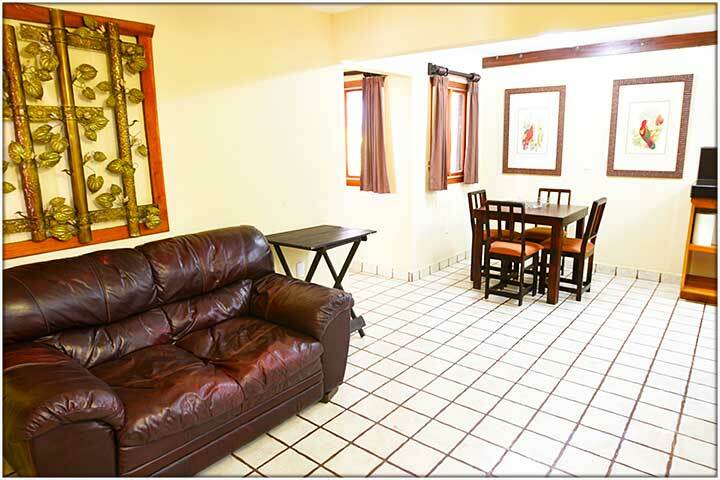 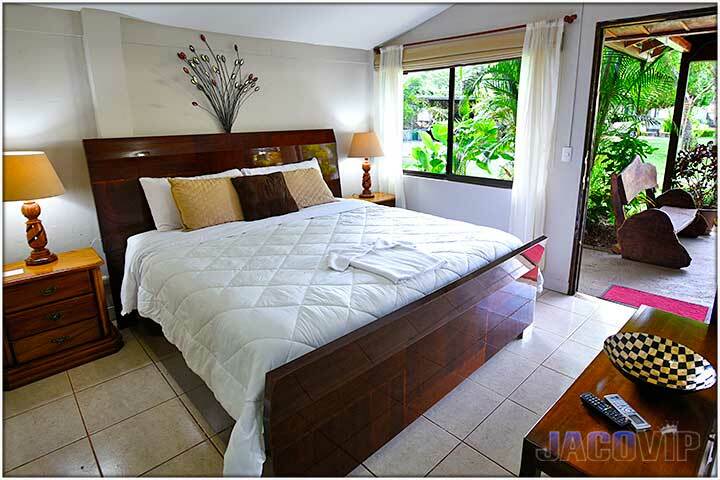 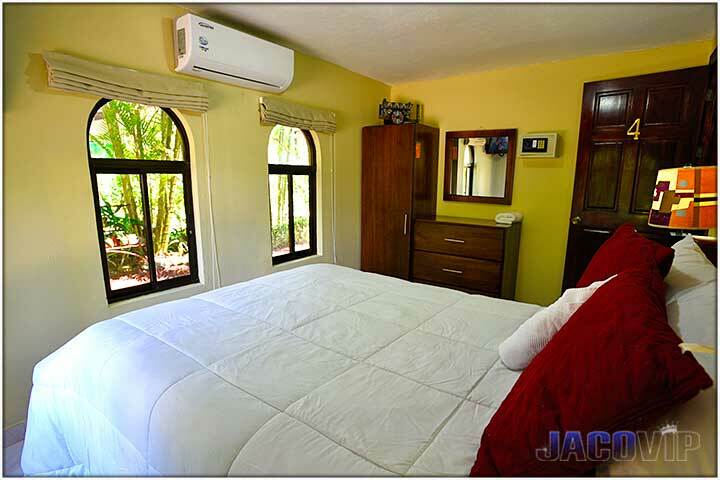 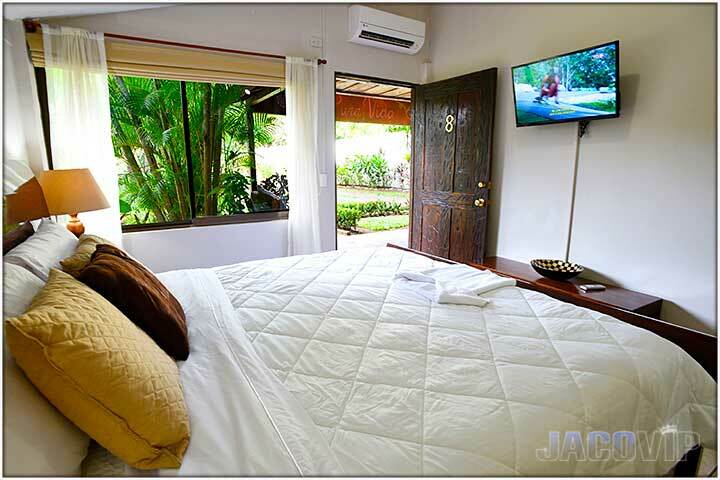 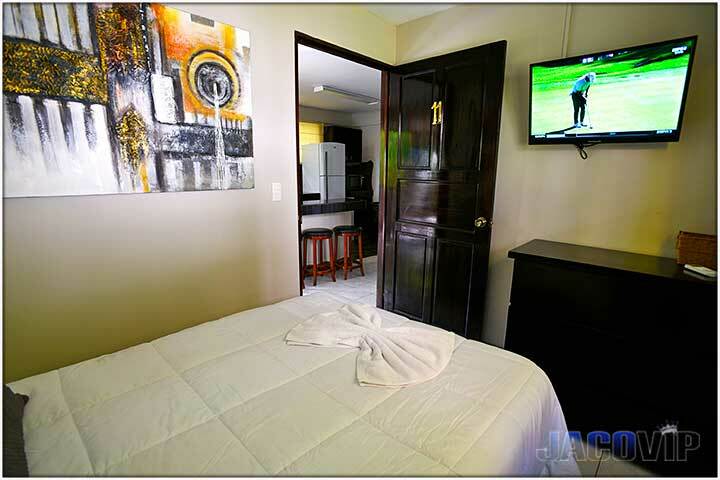 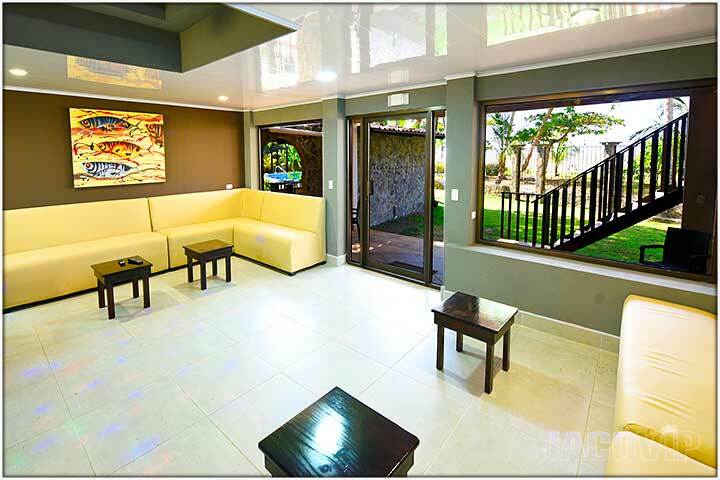 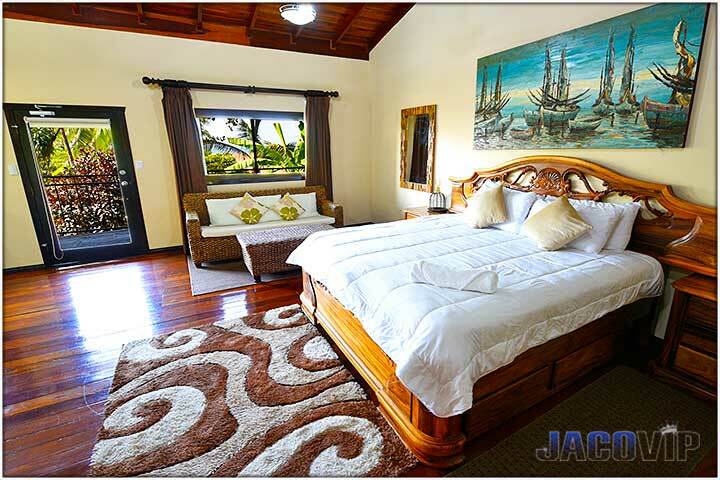 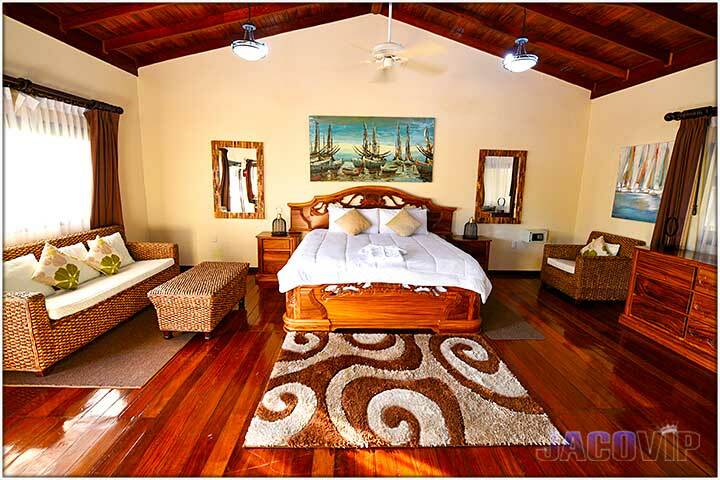 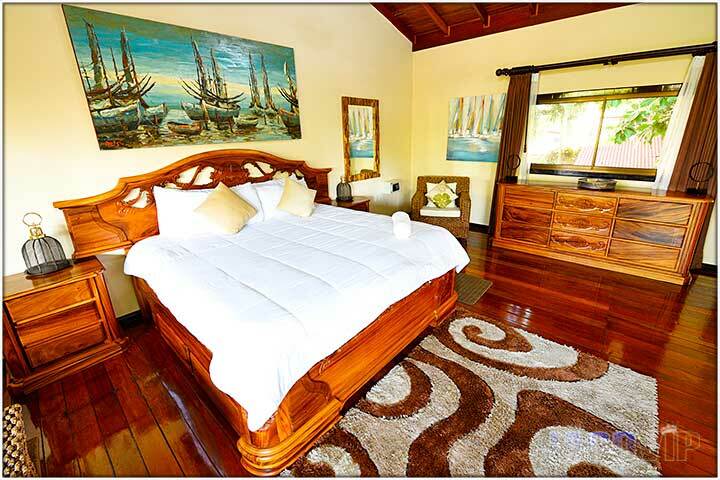 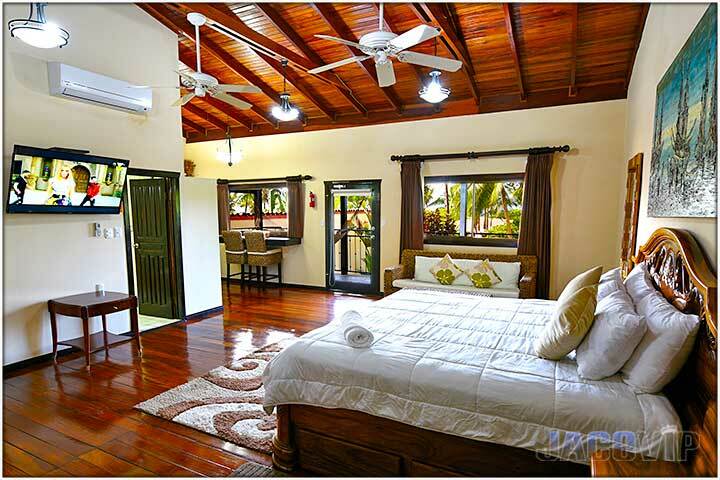 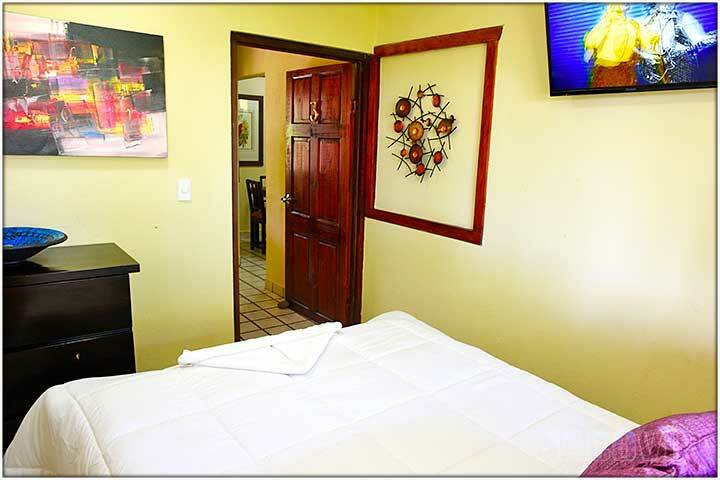 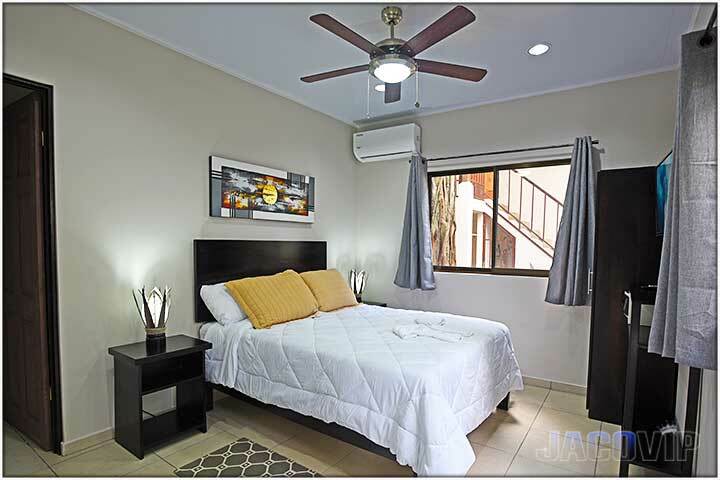 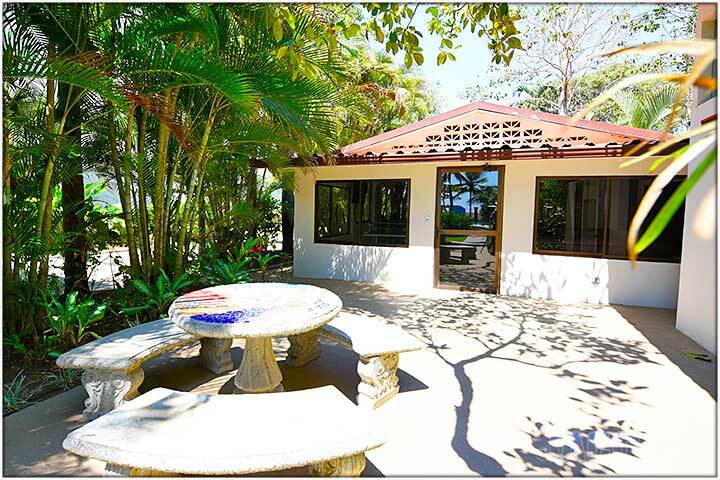 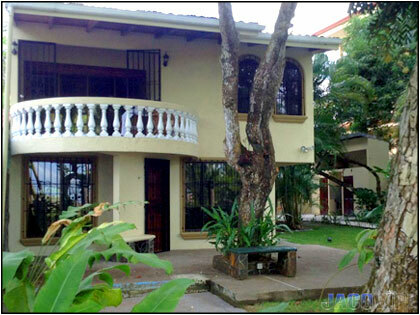 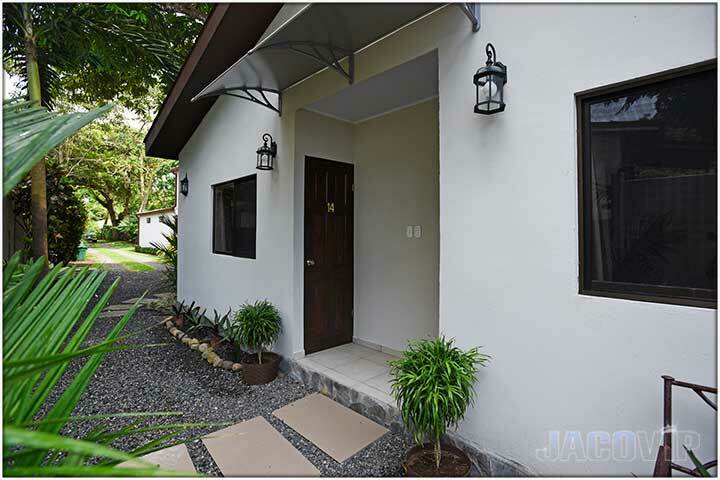 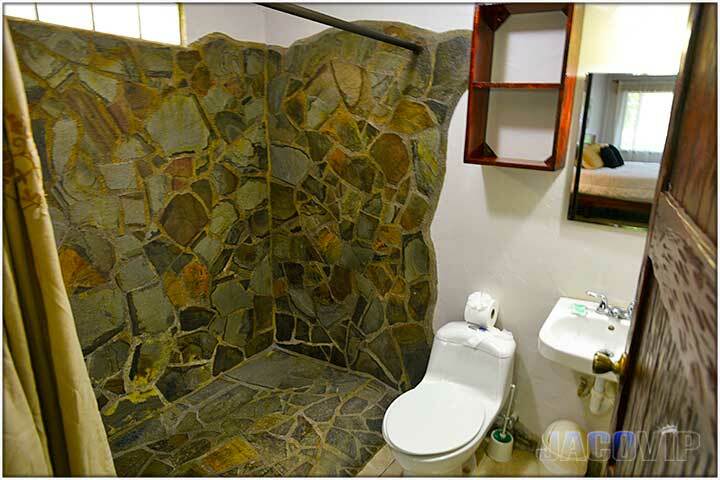 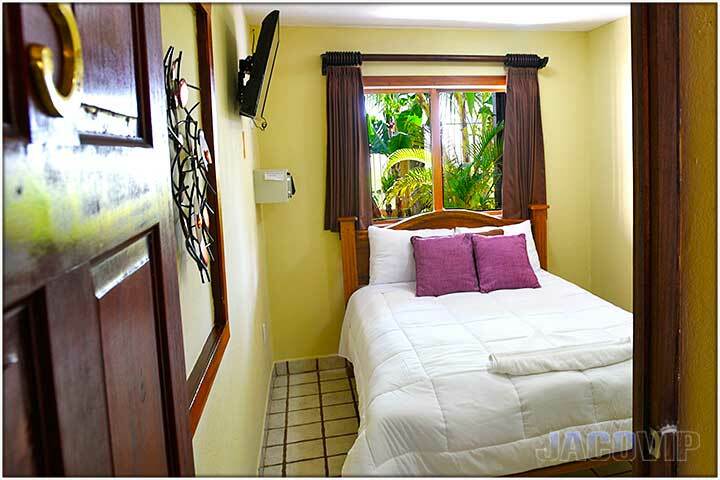 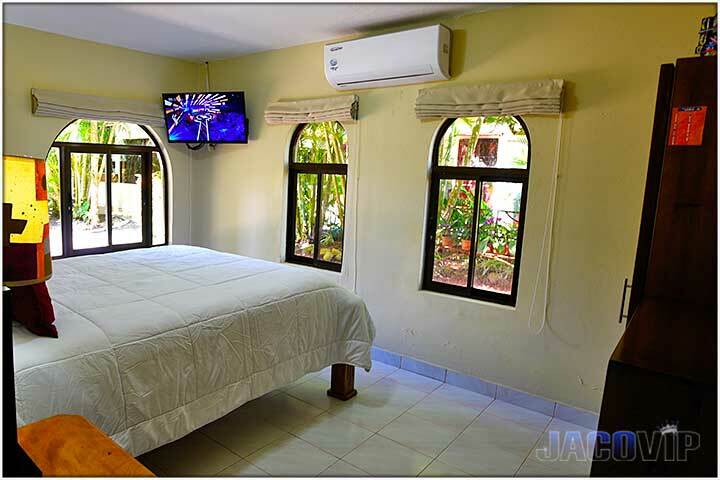 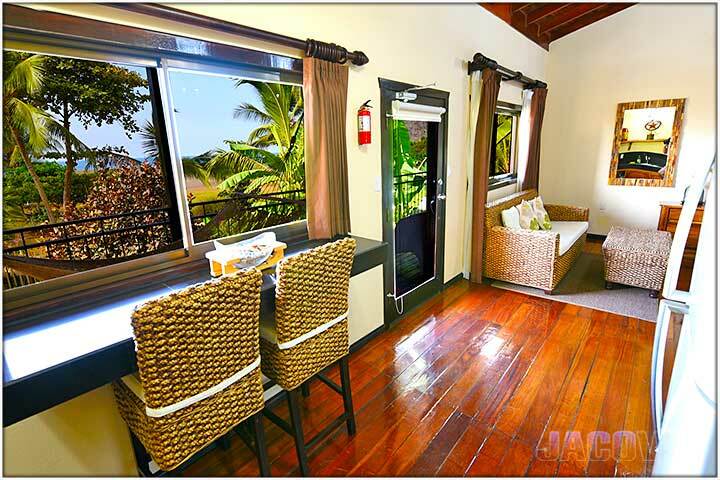 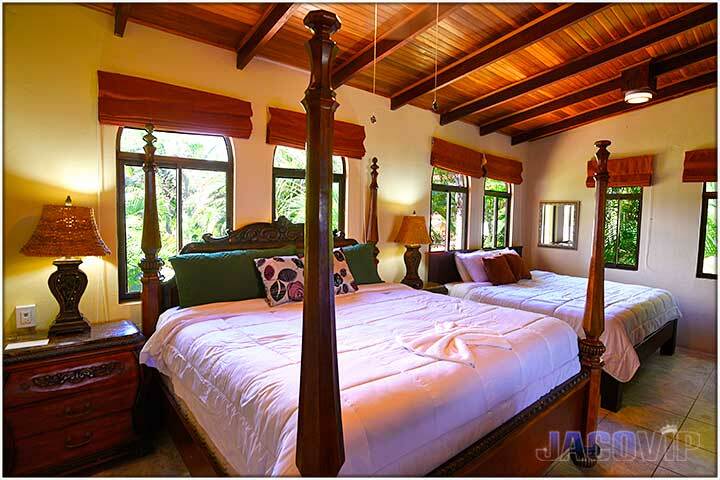 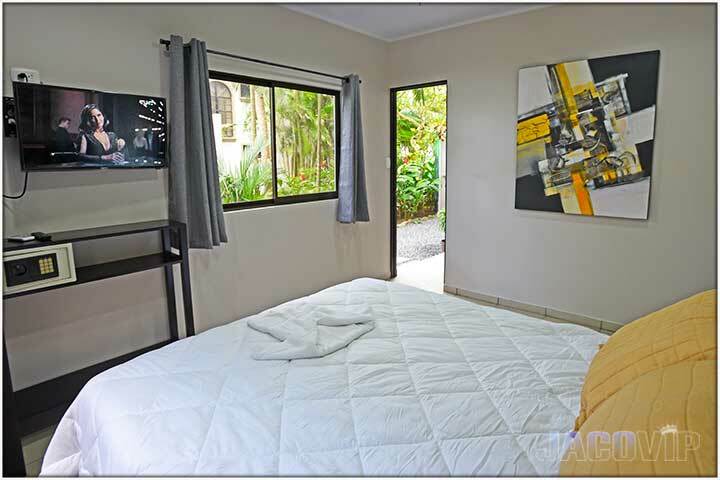 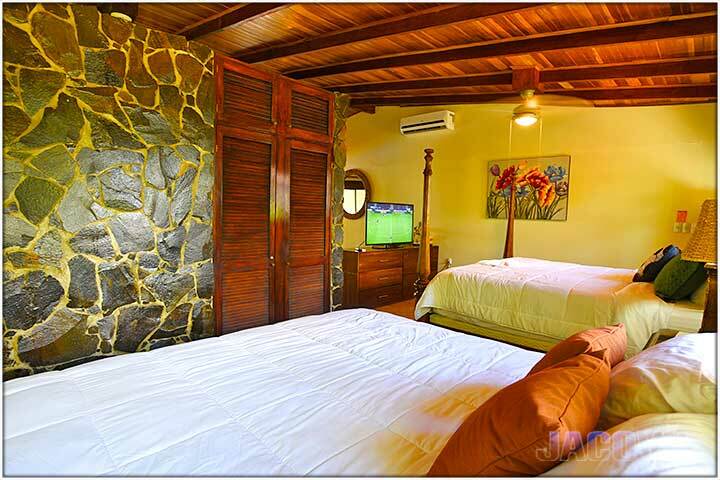 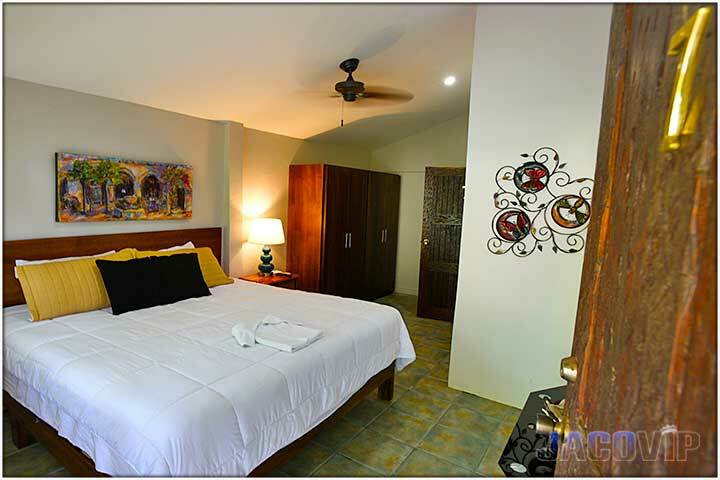 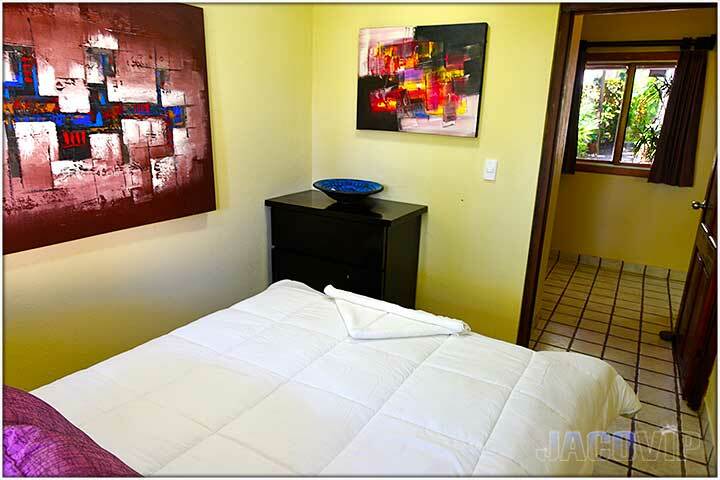 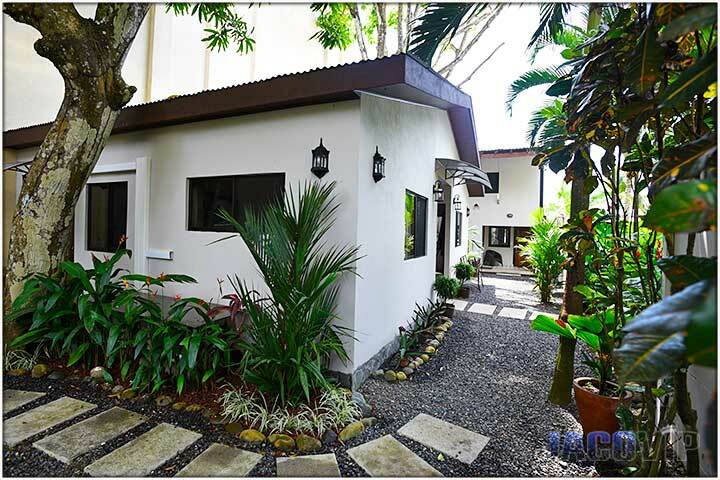 Casa #4 consist of four newly constructed bedrooms all with private entrances to the outside. 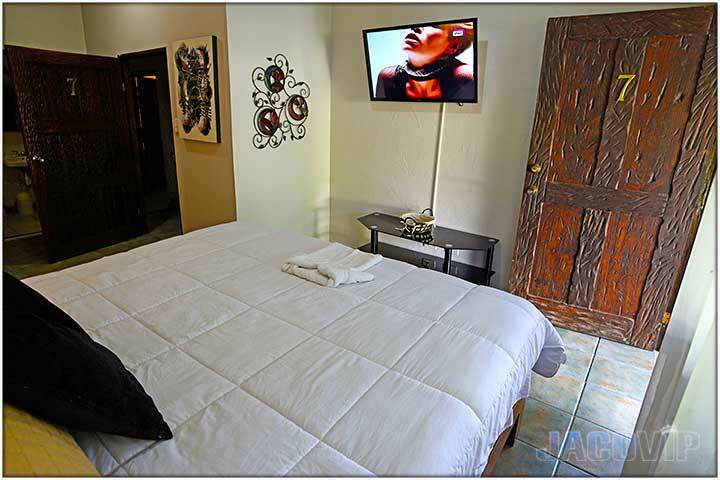 Each bedroom offers a queen size bed, TV and a safe box. 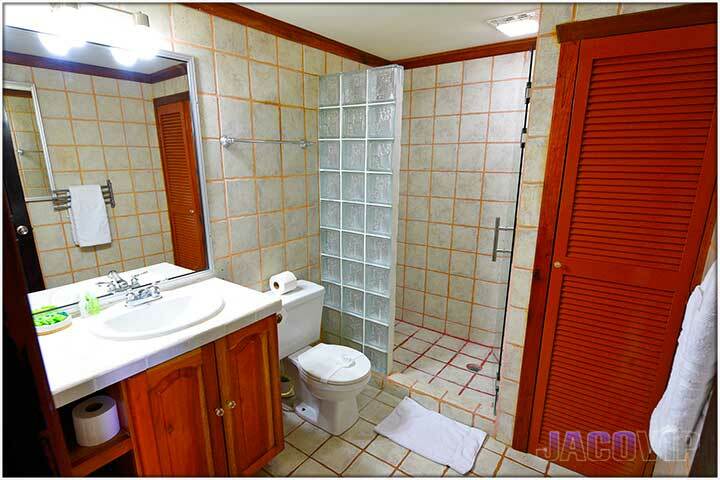 These four bedrooms share 2 full bathrooms. 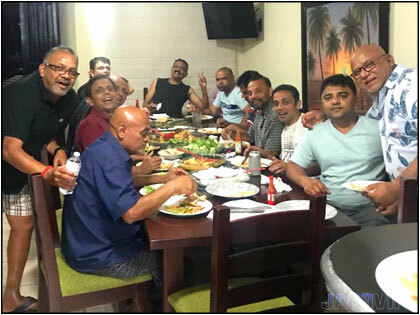 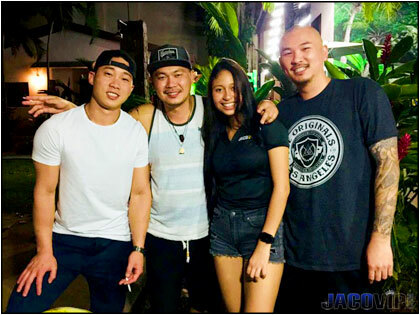 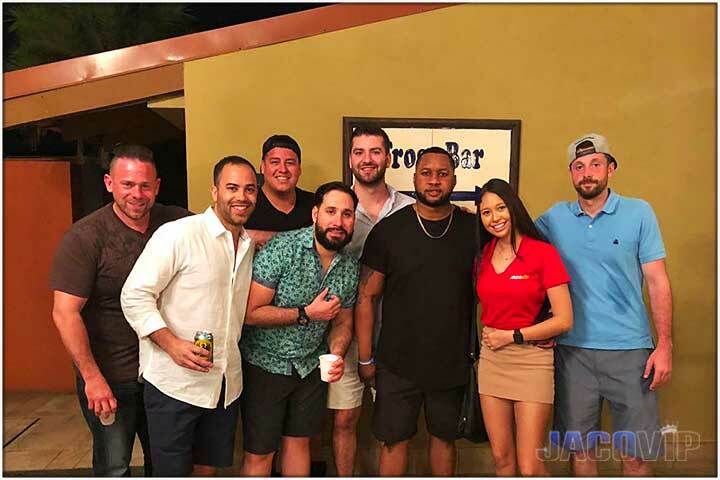 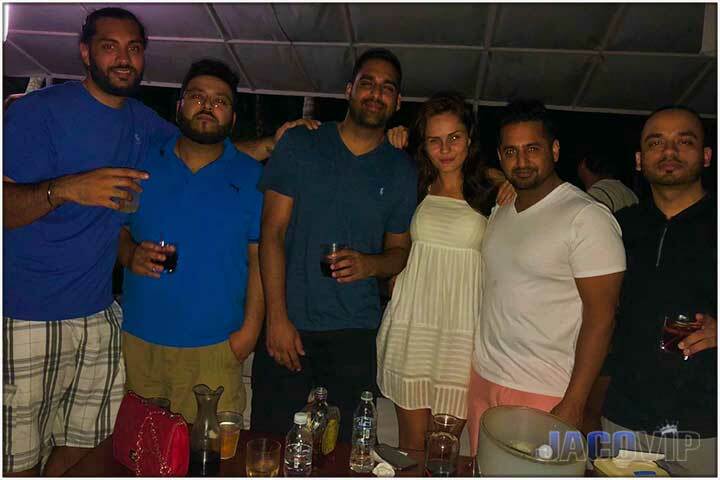 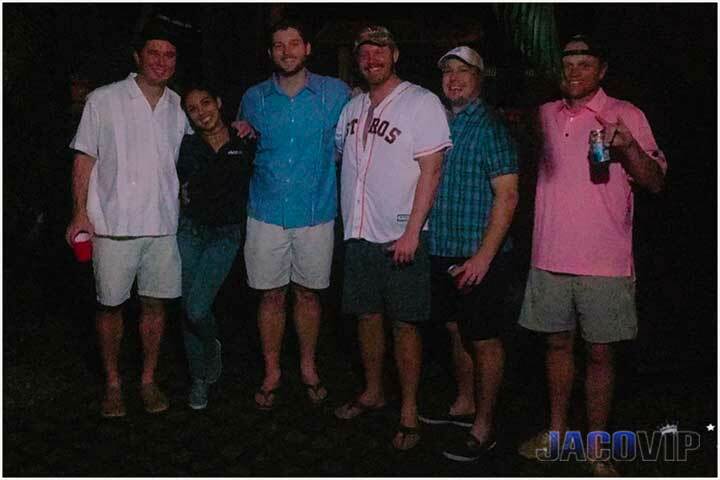 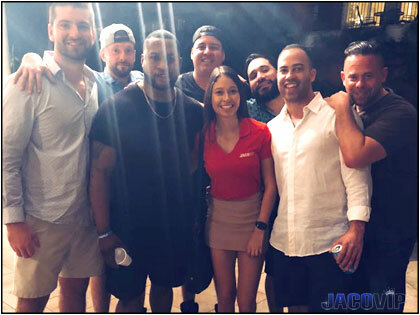 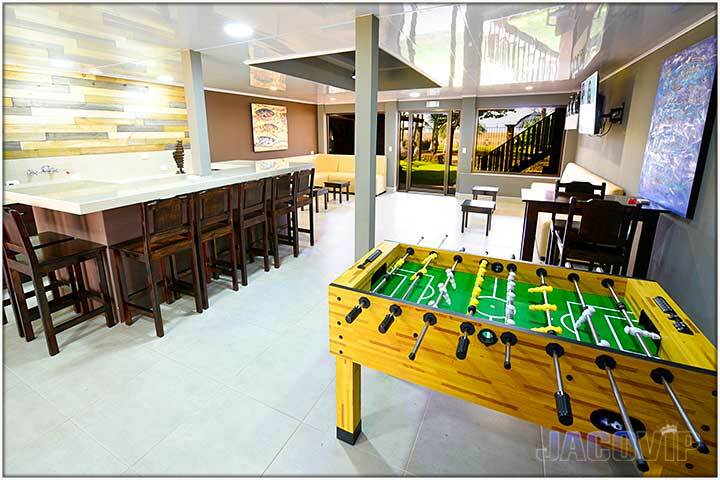 Party Room is the newest addition to Serenity Point and offers a Private Club area that allows guests to party all night long. 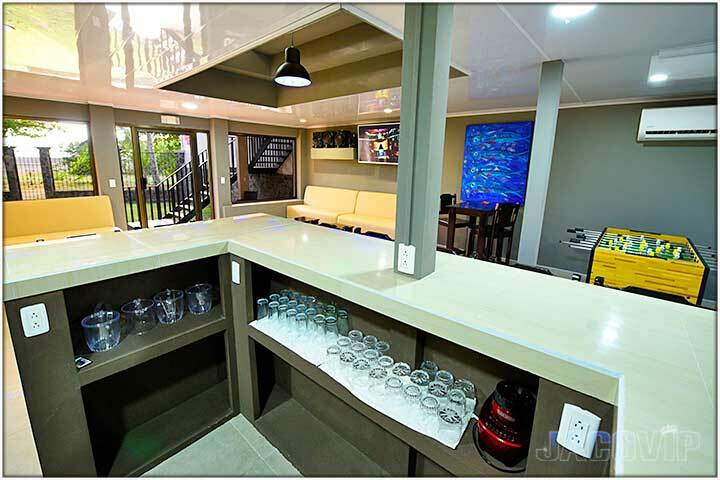 This space offers a full bar, dance floor, lounge sofas, high-top tables, kitchen area with sink and refrigerator and a bathroom. 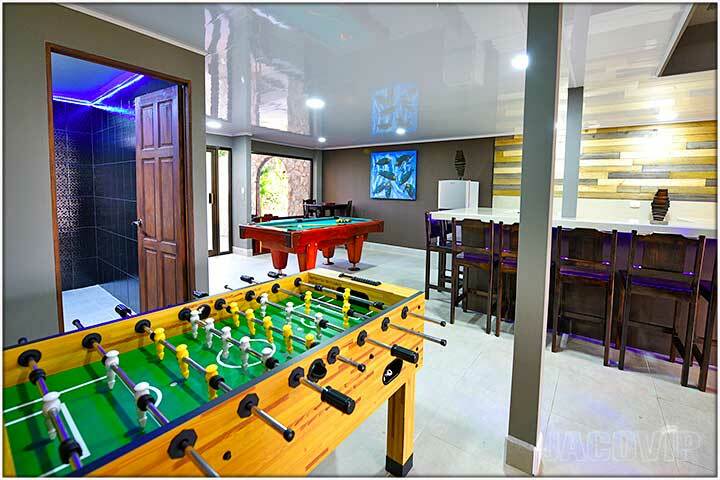 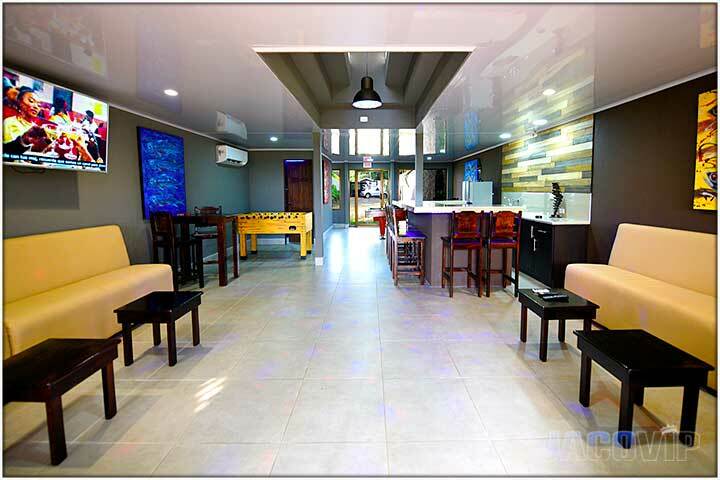 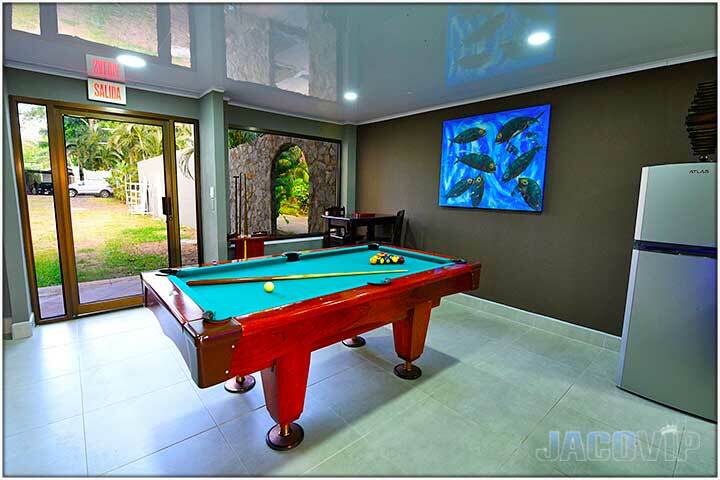 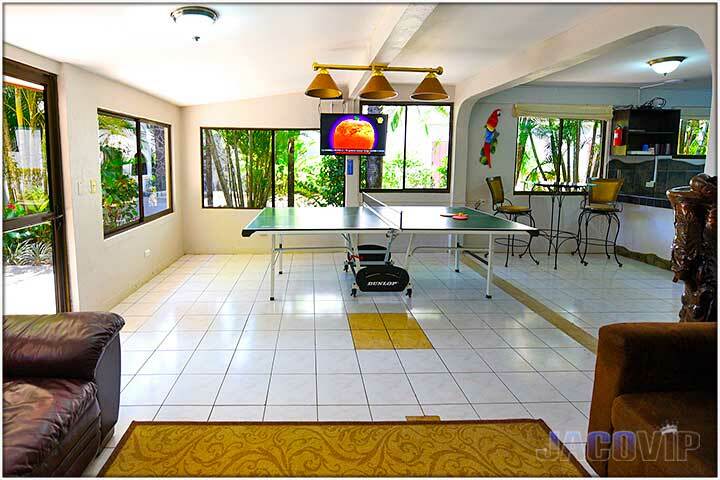 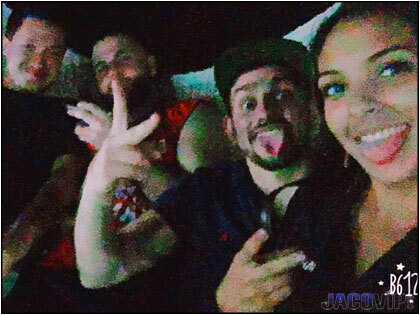 For fun enjoy the Pool Table, Foosball Table, Poker Table, A/C, Disco Light, Large HDTV’s, Sound System! 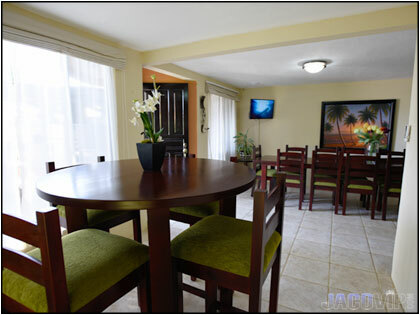 • Prices listed up to a maximum of 18 people. 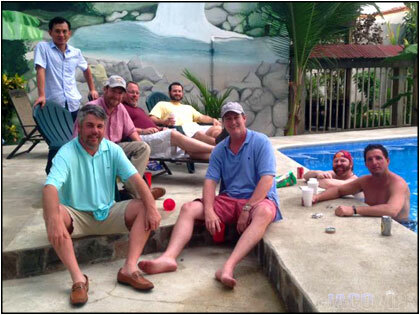 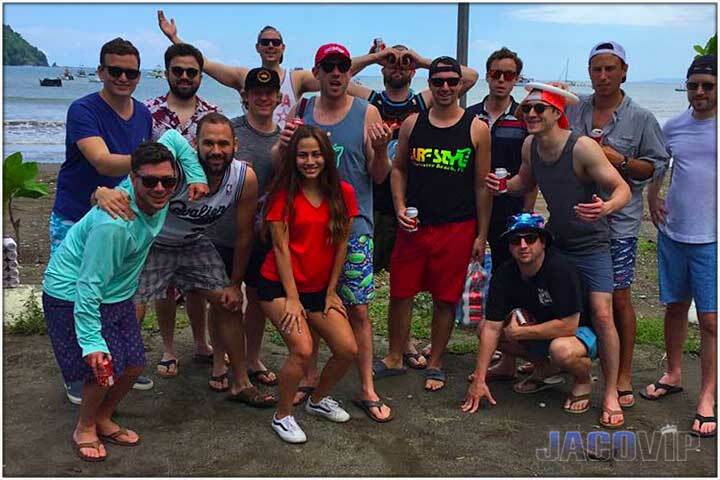 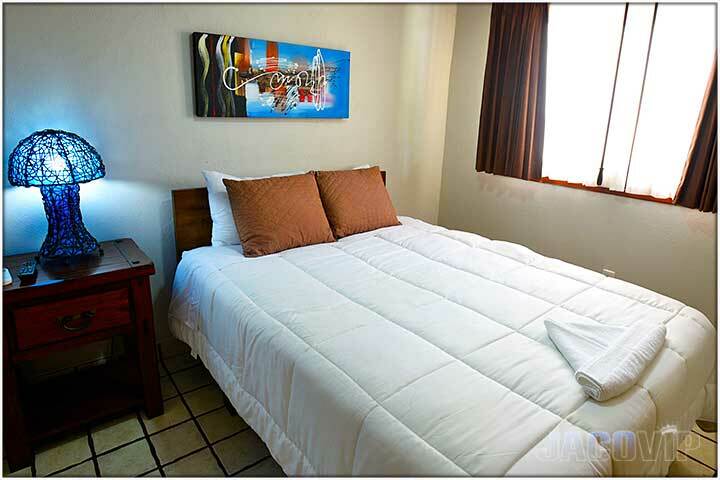 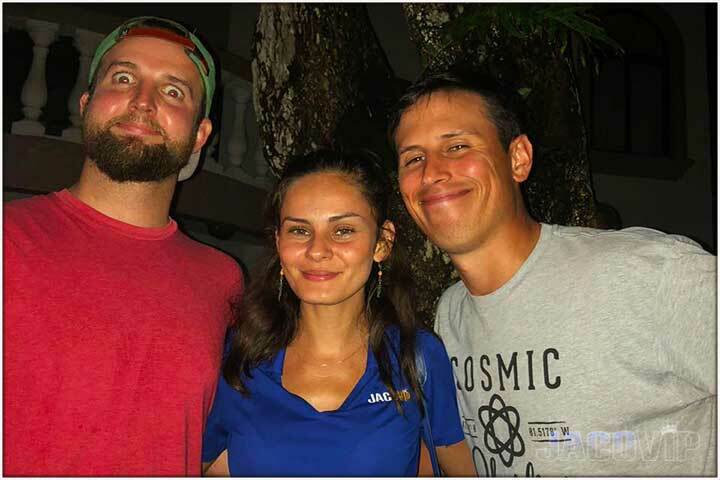 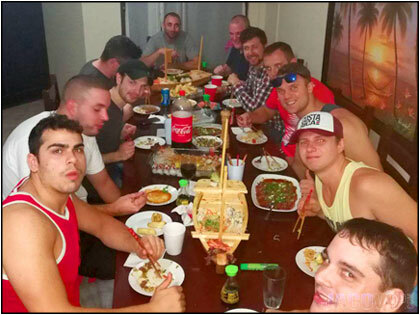 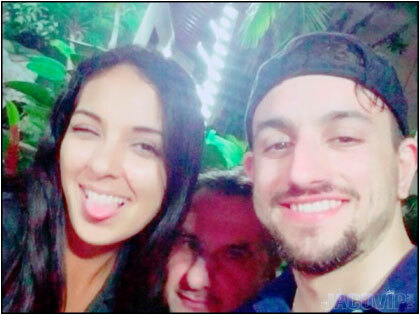 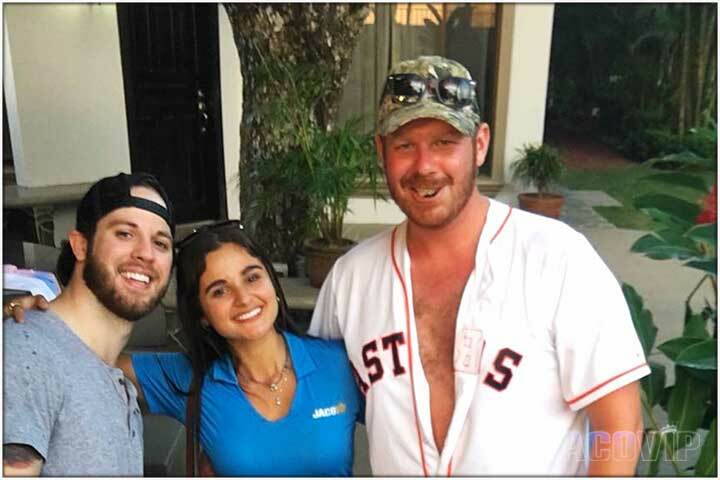 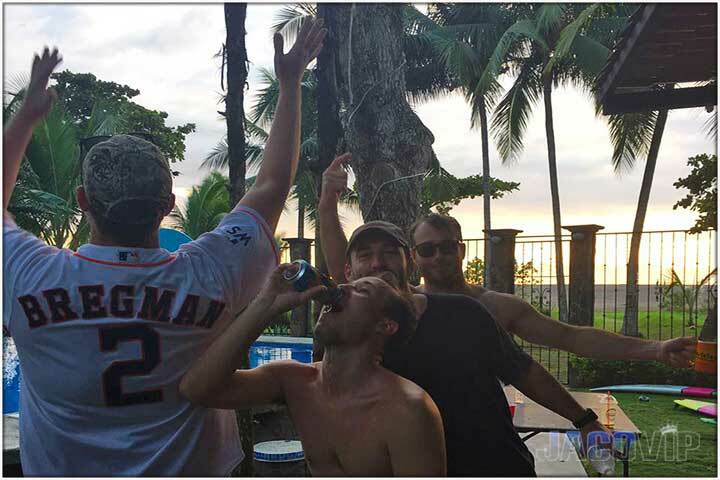 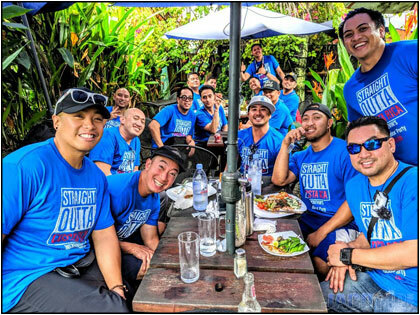 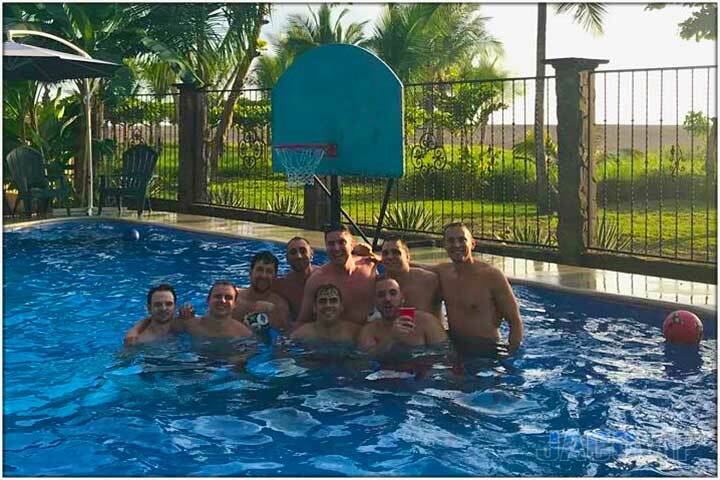 • For groups over 18 people, add $30/person per night, up to a total maximum occupancy of 22. 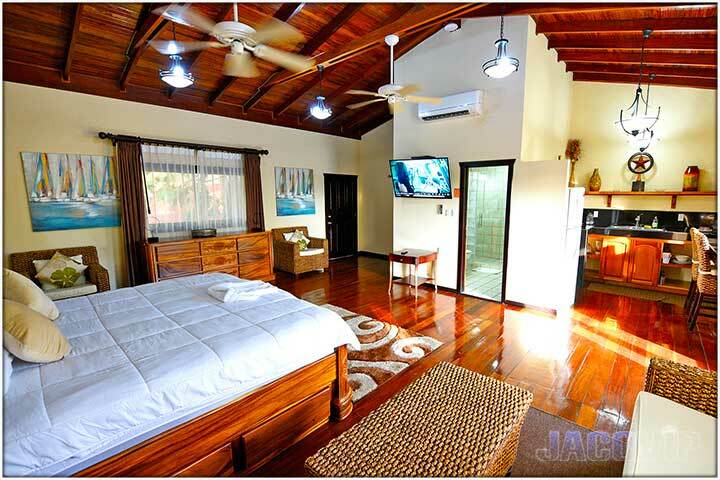 • 15 Bedrooms. 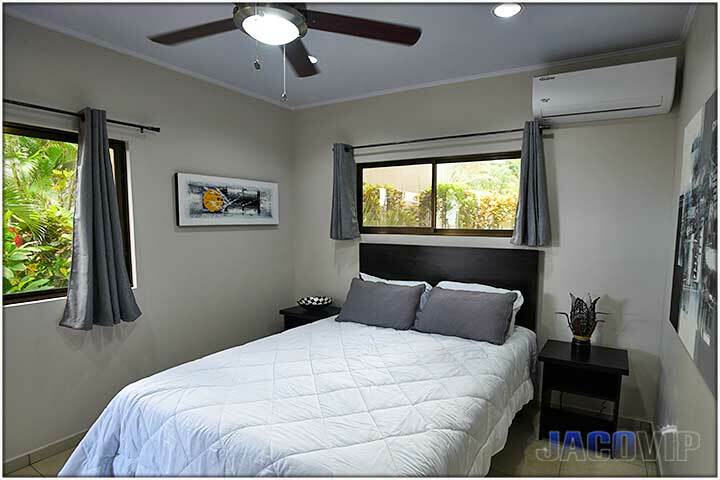 Every Bedroom has AC, TV and Safebox. 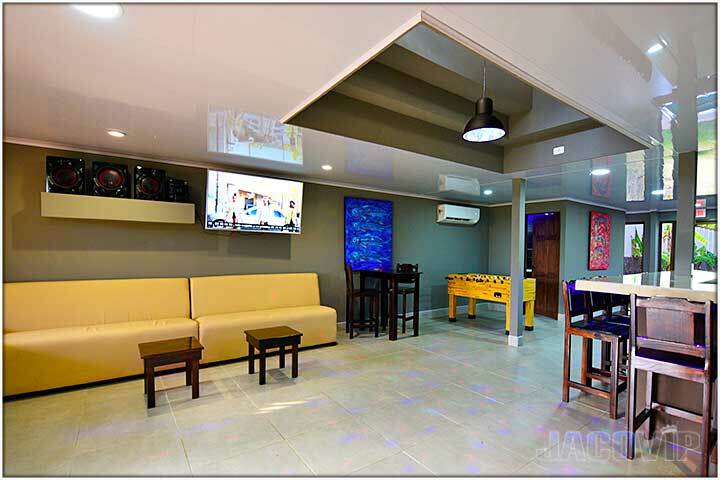 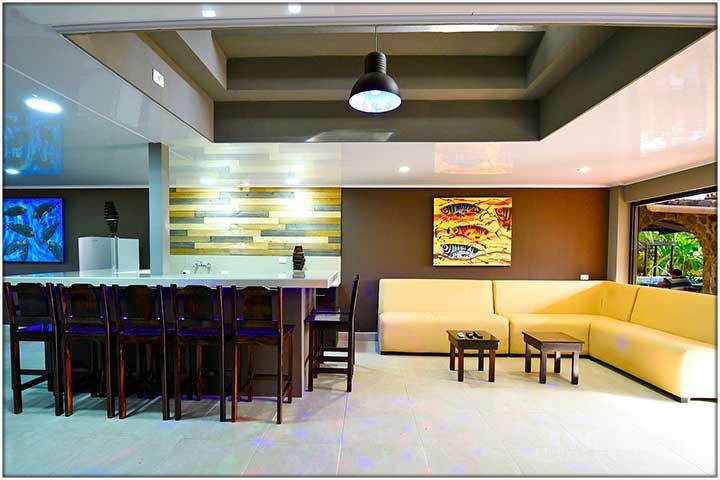 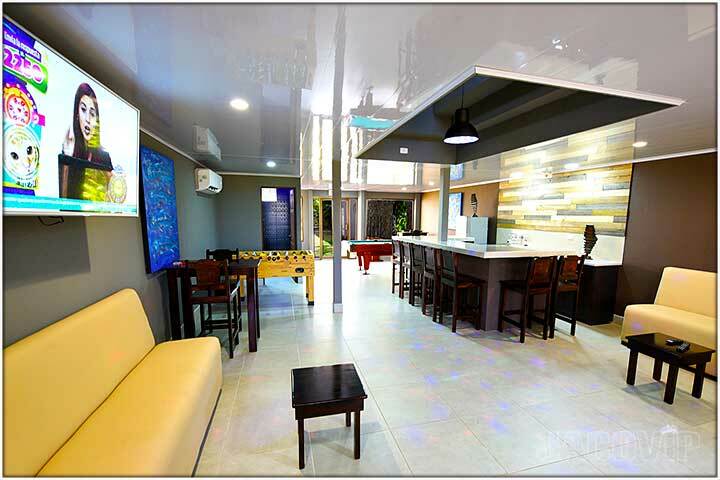 • Living Room with Pool Table, Sofas, AC, TV and Full Wet Bar with Fridge. 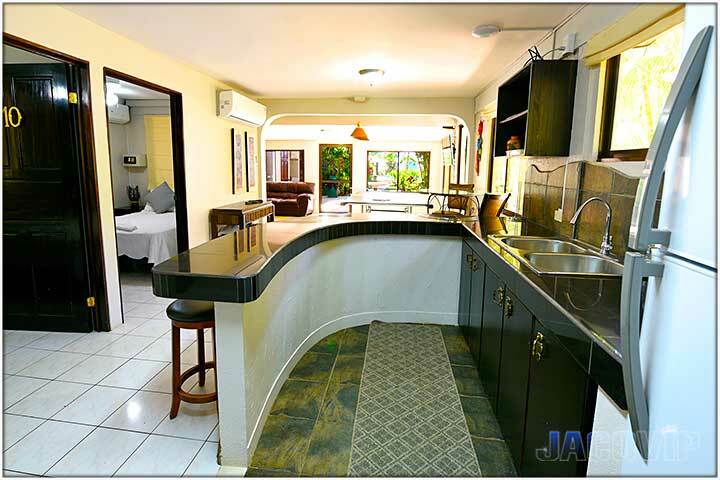 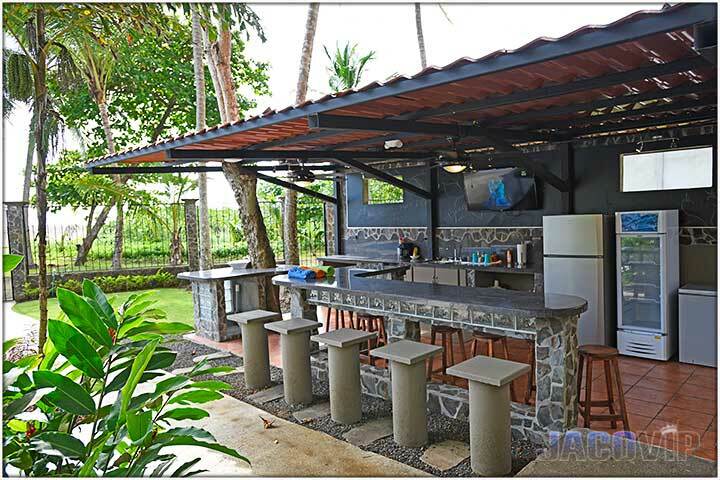 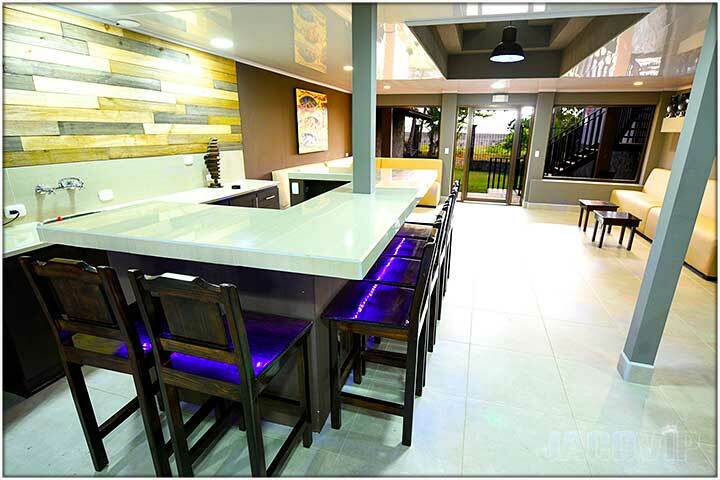 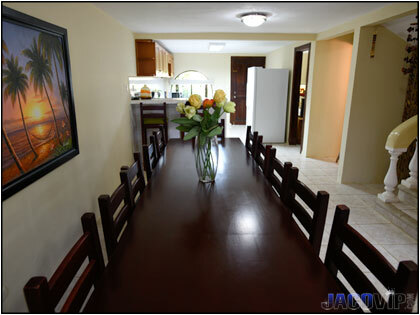 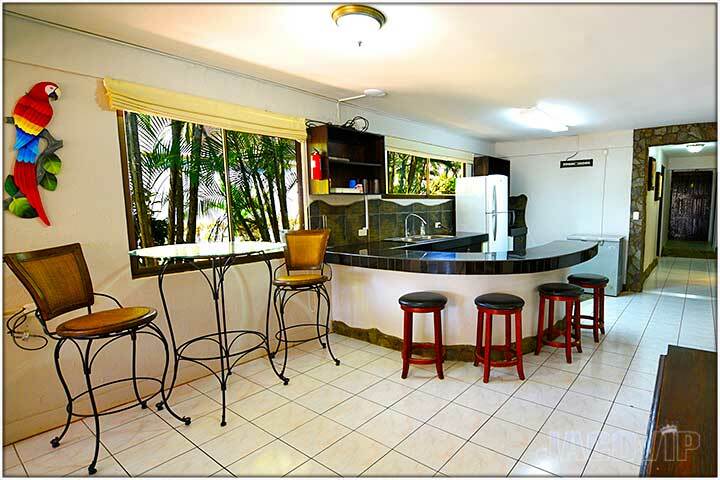 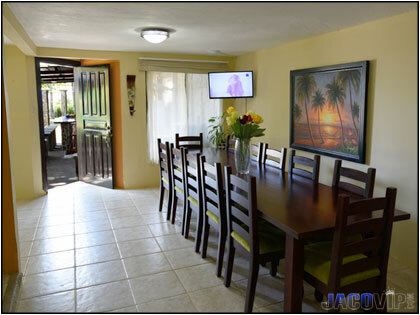 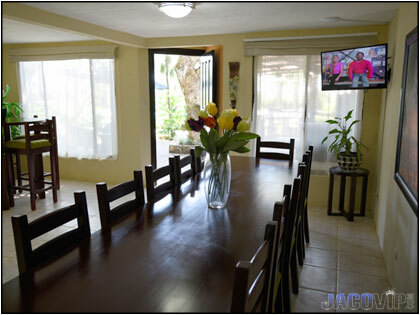 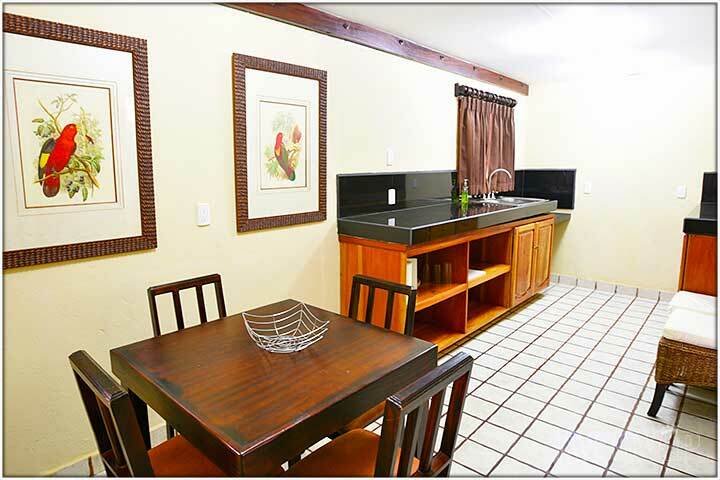 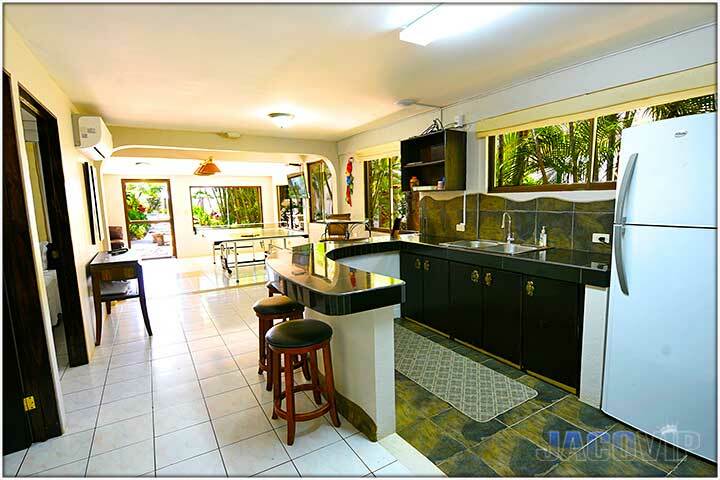 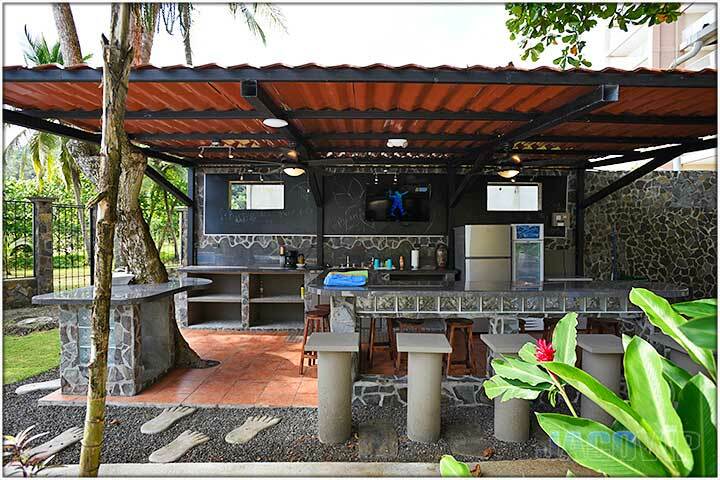 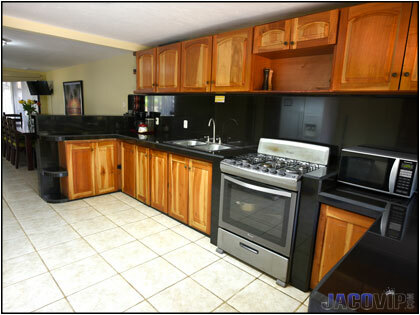 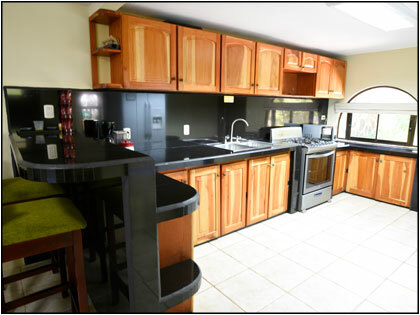 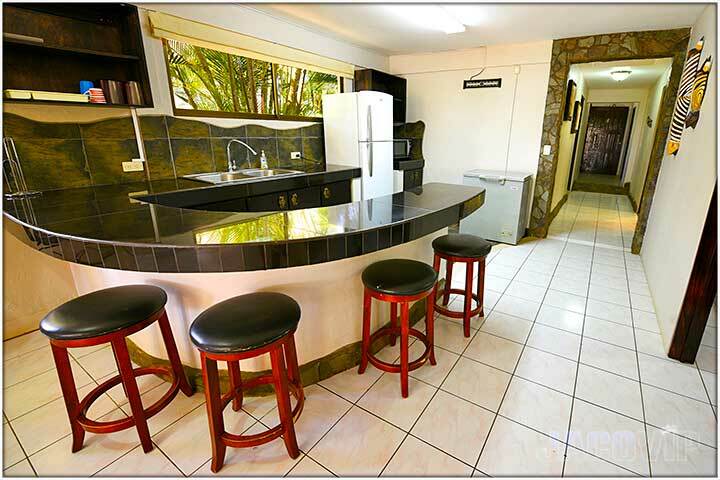 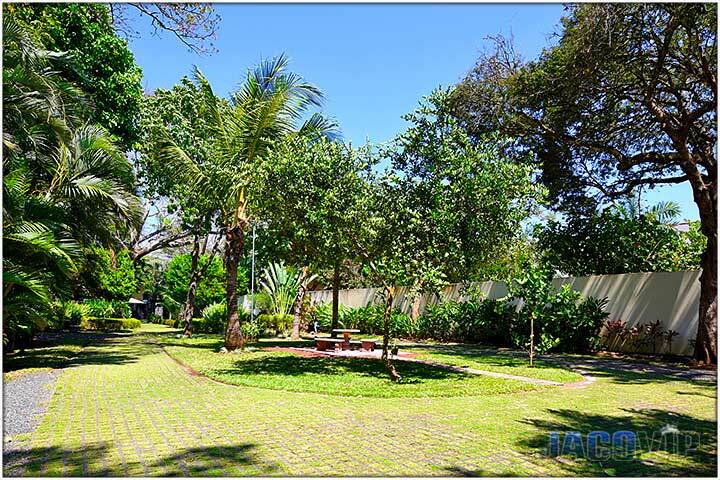 • Fully Equipped Kitchen and Dining Area with AC for up to 18 people. 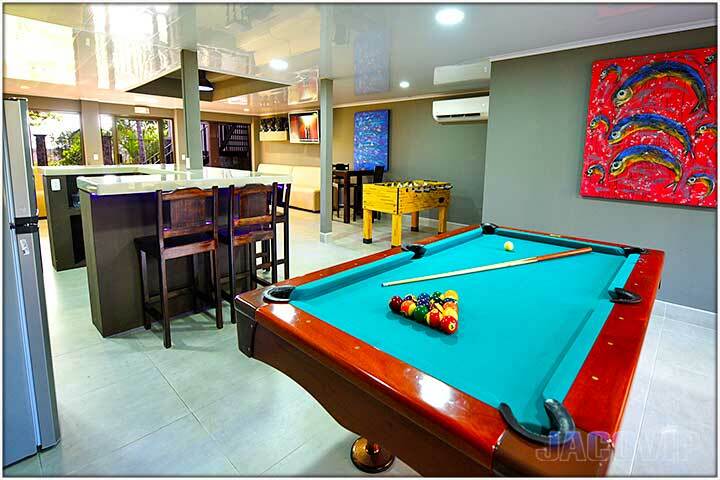 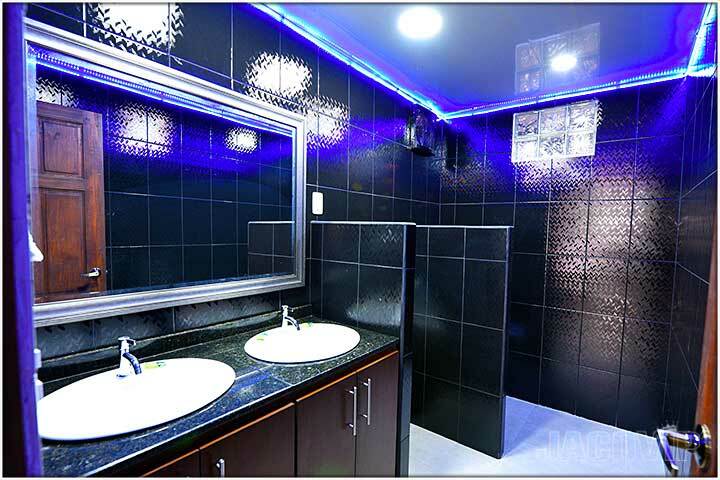 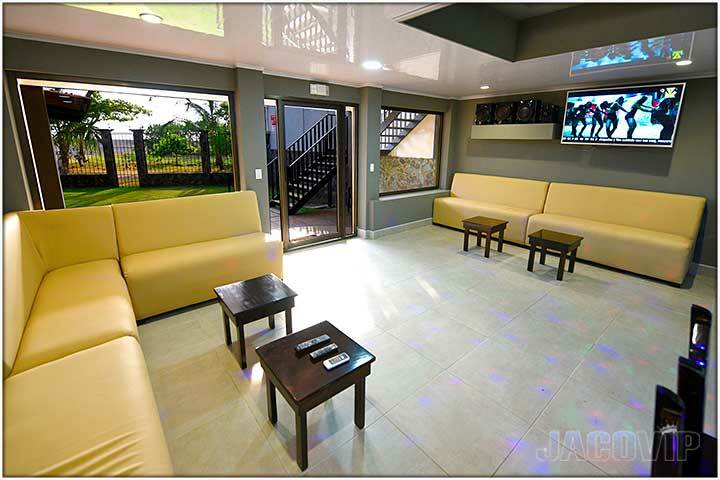 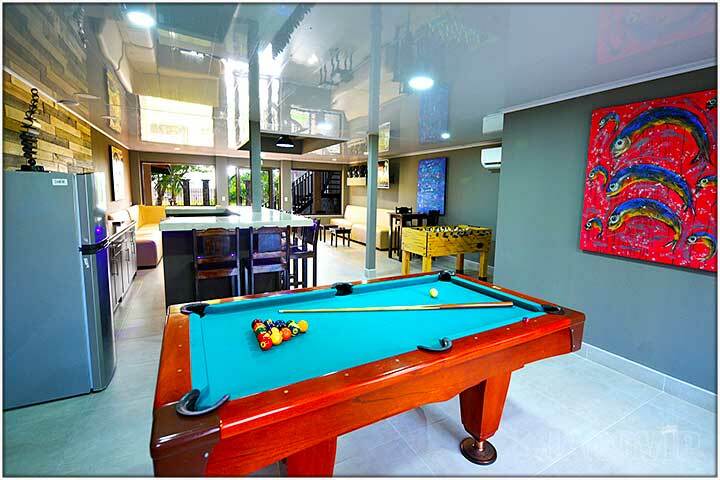 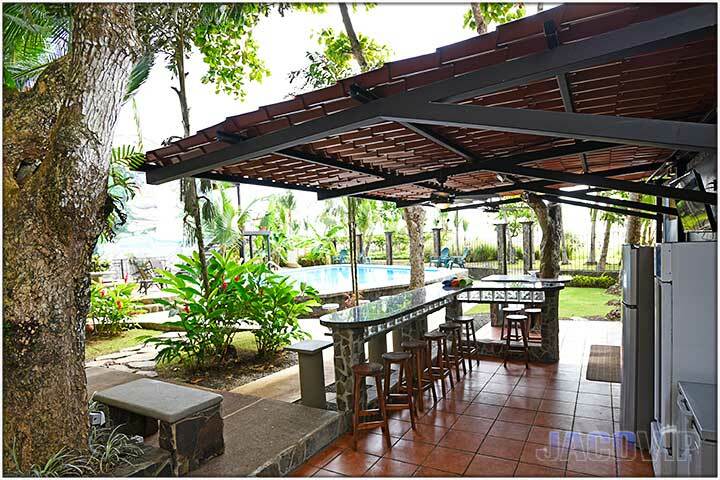 Includes large TV, Bar equipped with bar stools, glasses etc., Pool Table, Foosball Table, Poker Table and chairs, AC, Sofas, etc. 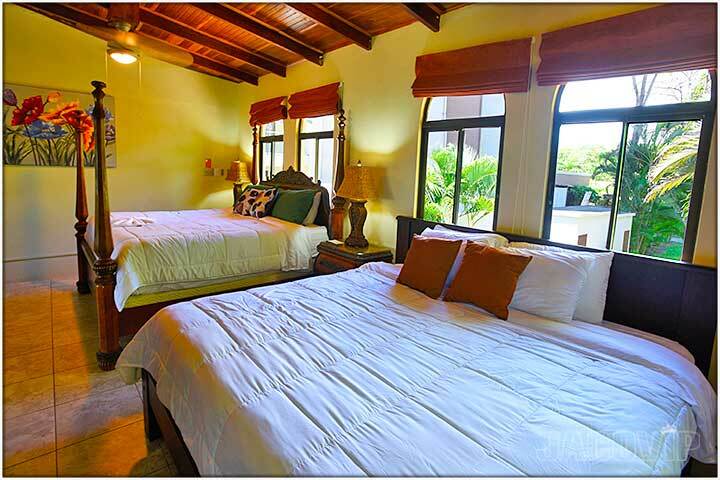 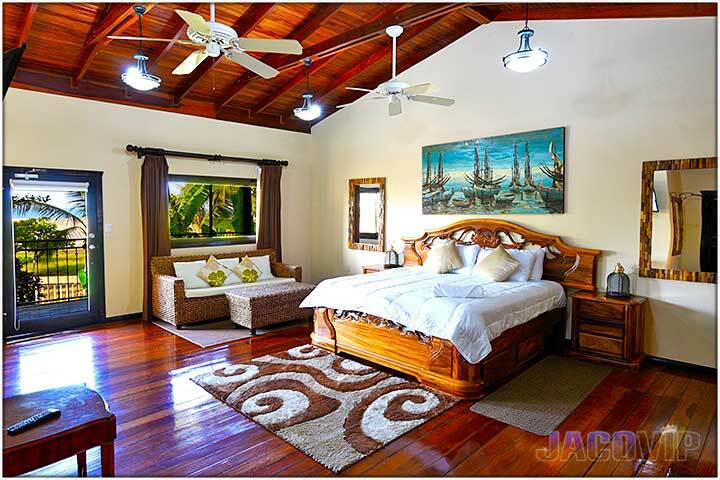 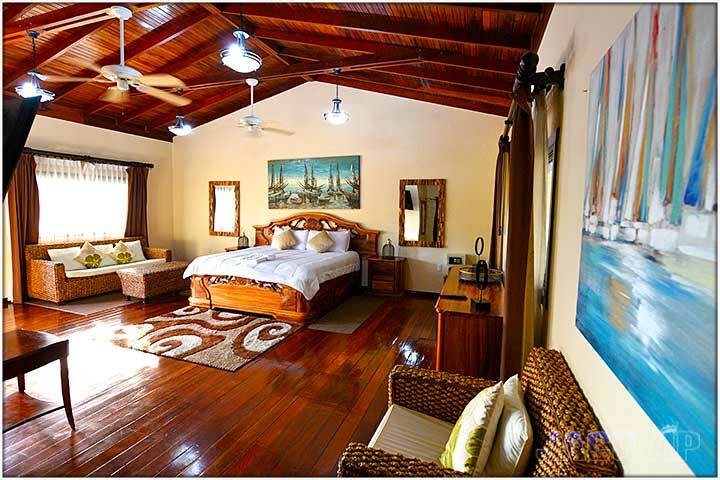 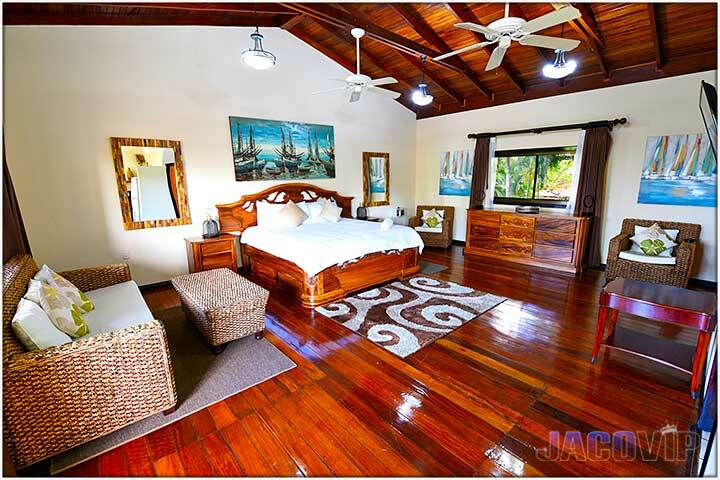 CASA #1: 1000 SQUARE FOOT LUXURIOUS MASTER BEDROOM WITH OCEAN VIEWS! 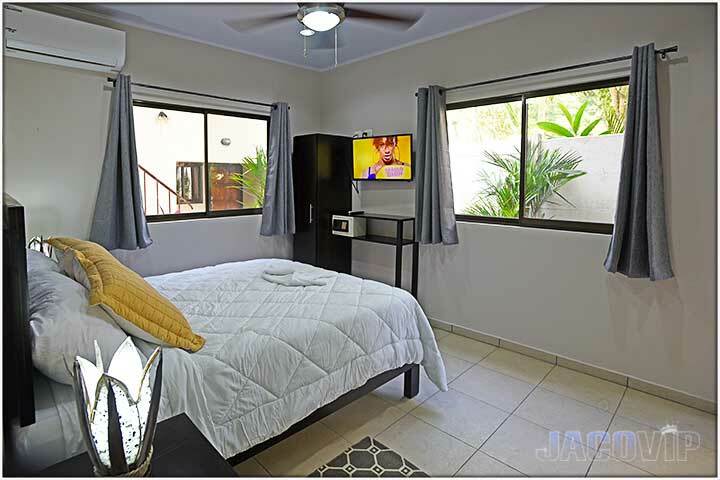 2nd Floor Master Bedroom with private bathroom, AC, TV, Fridge, bar seating and living area... Plus spectacular ocean views!! 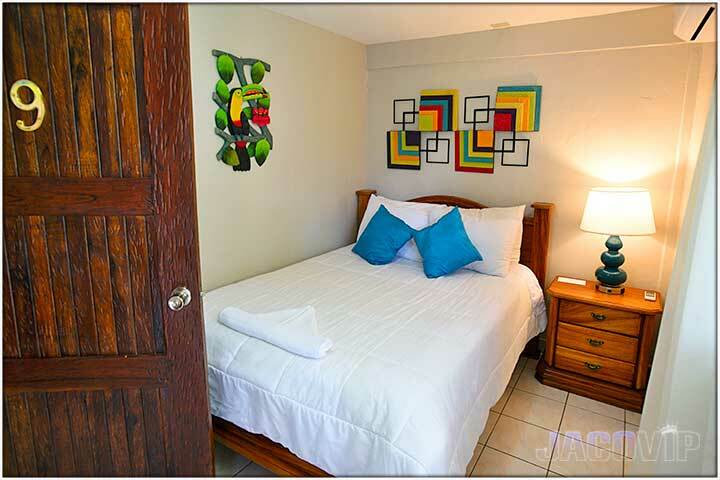 Ground floor has 2 more bedrooms and one full bathroom. 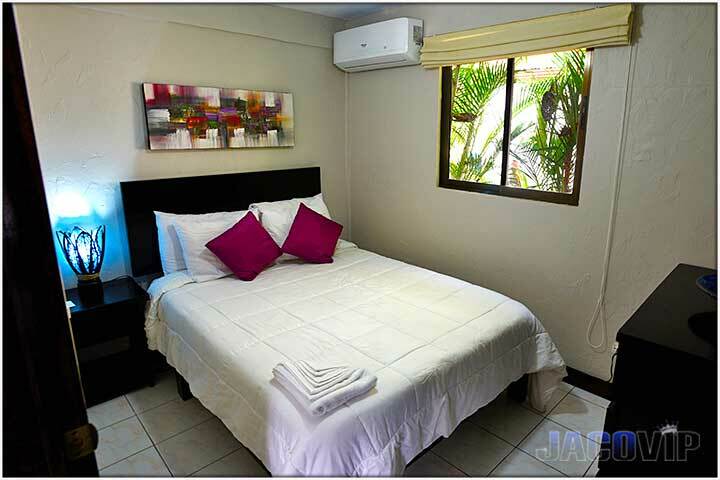 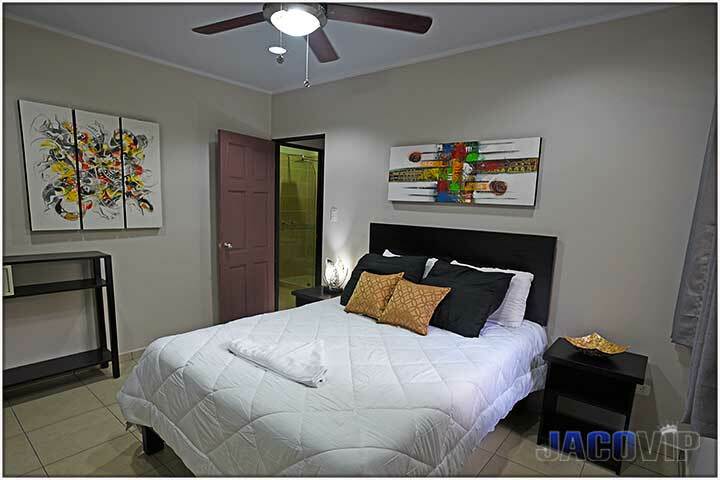 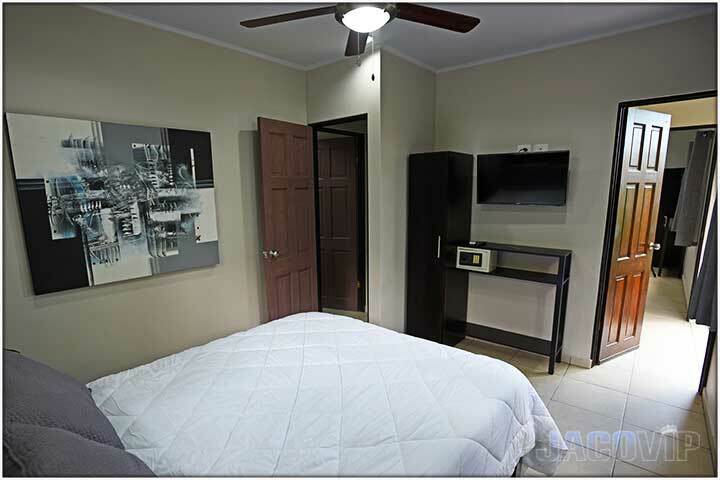 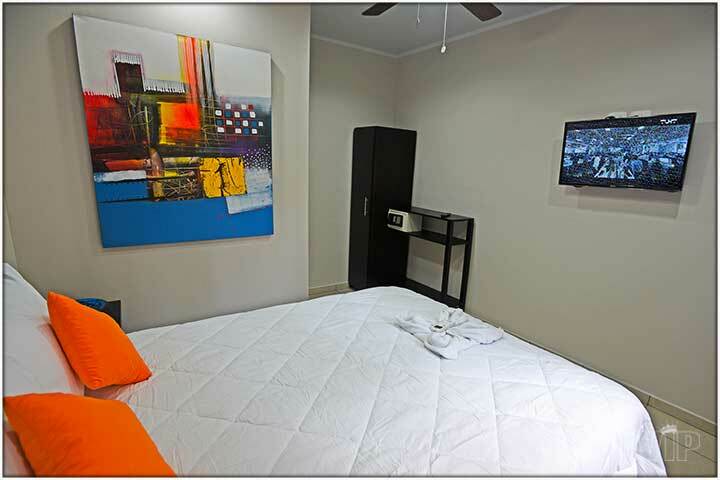 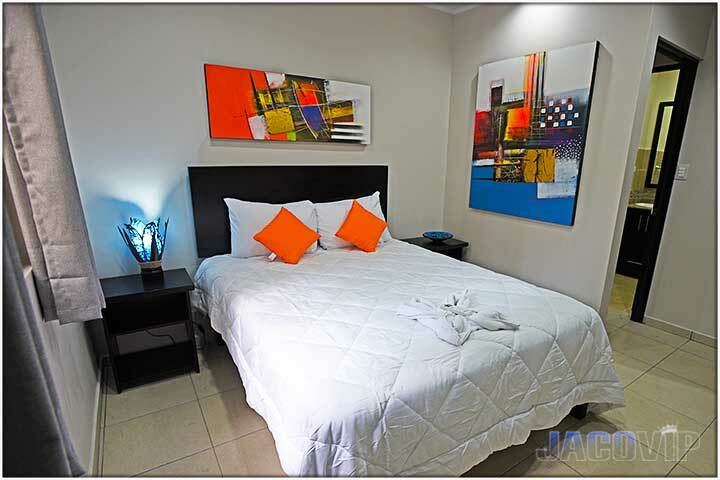 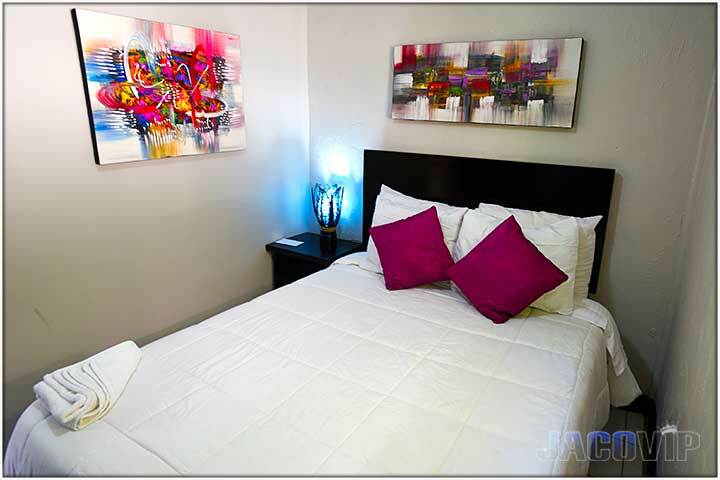 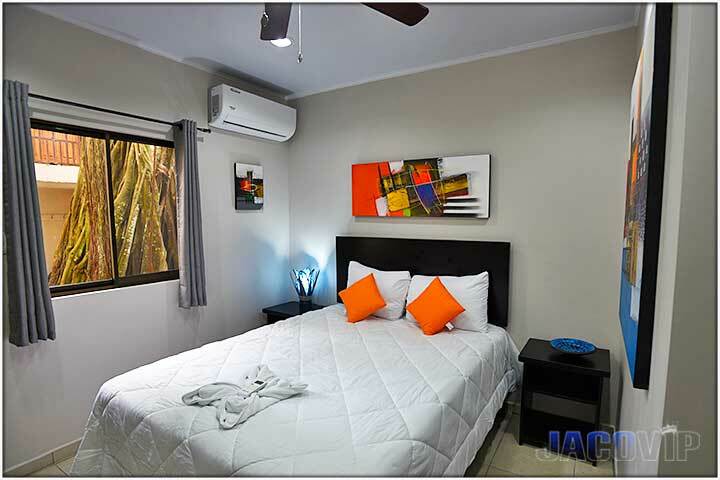 4 Bedrooms with 1 Queen size bed each, AC, TV and Safebox. 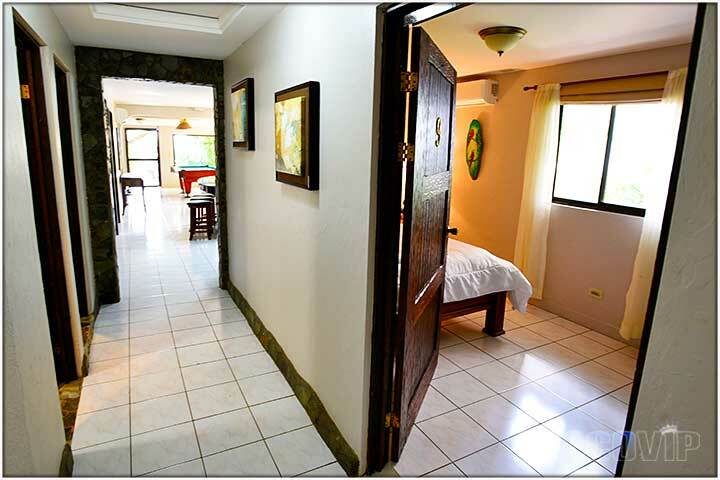 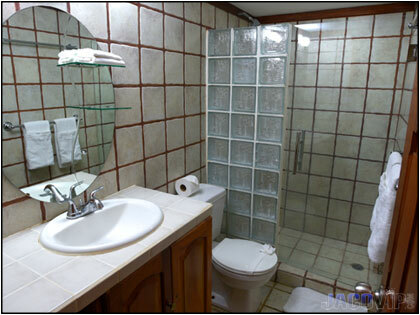 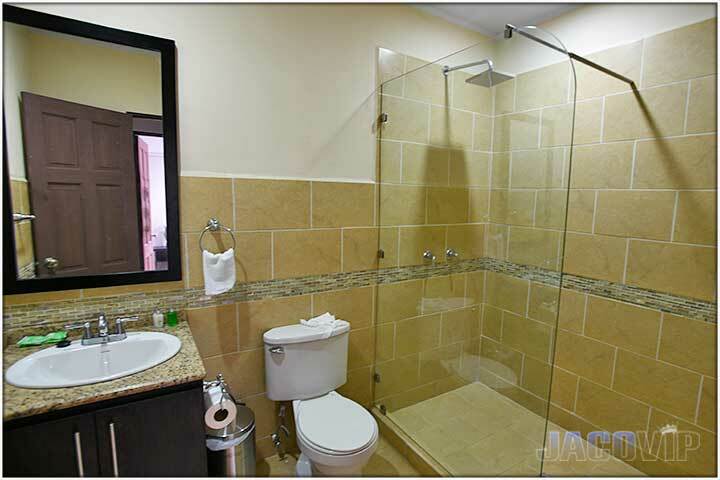 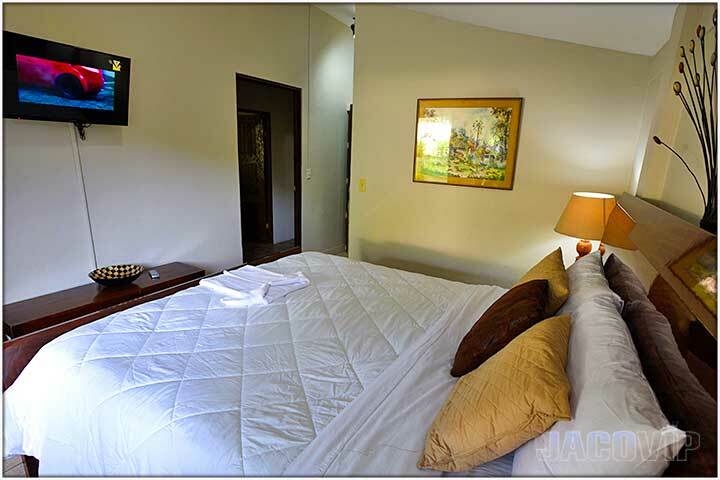 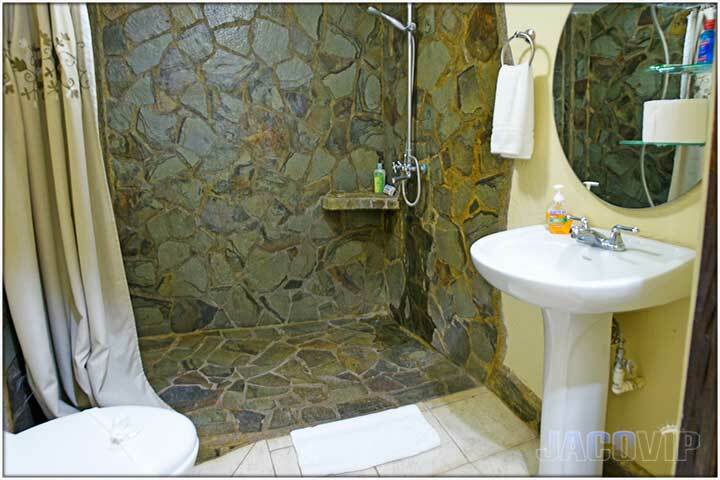 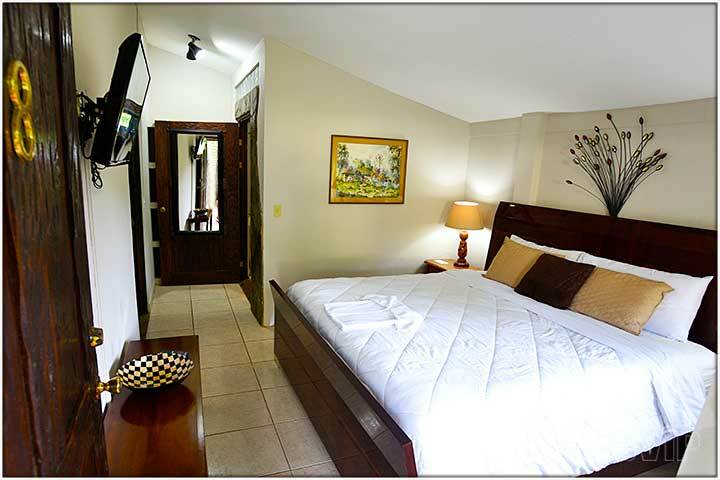 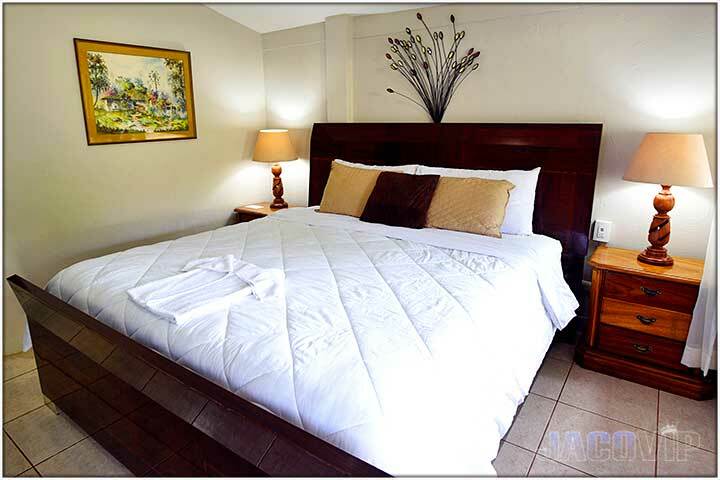 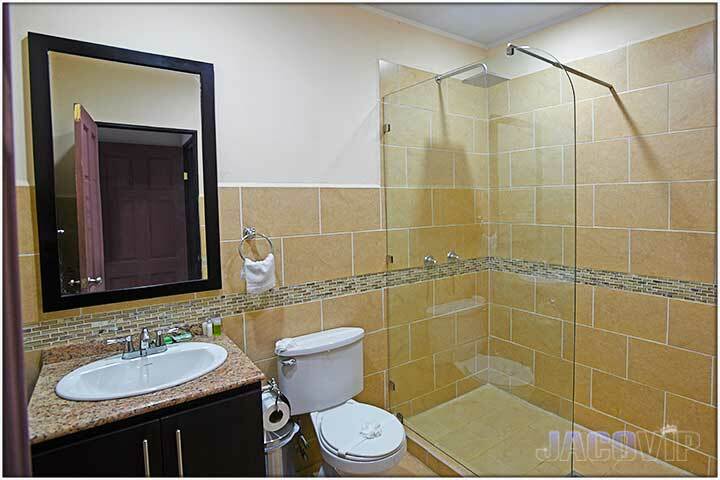 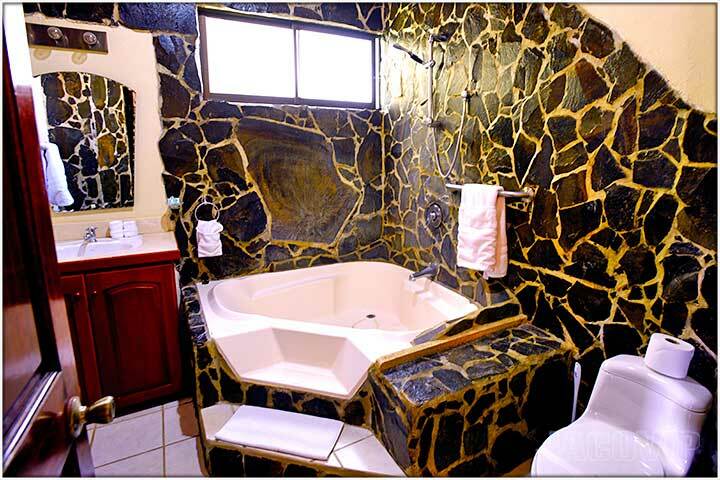 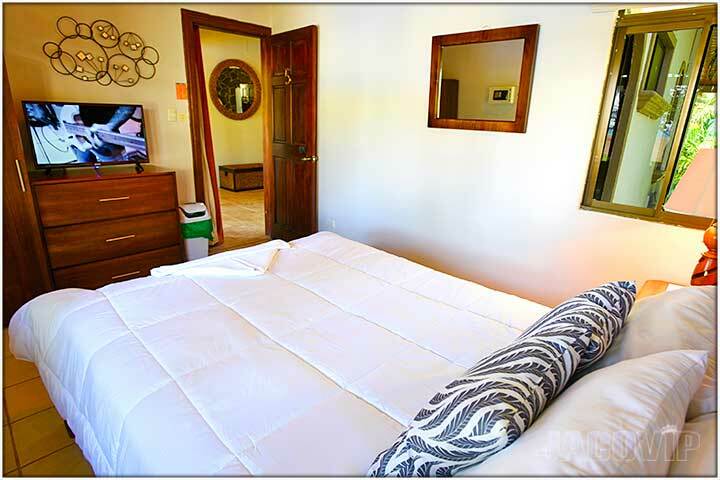 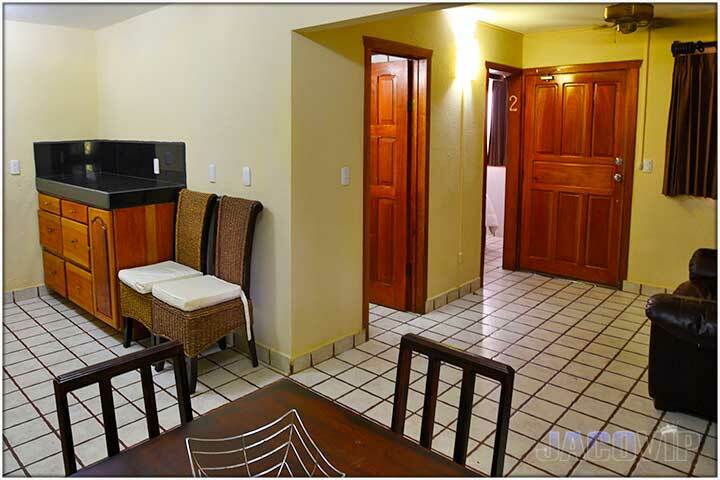 Seperate and private, each bedroom has its own entrance, and share 2 full bathrooms connected by a short hallway. 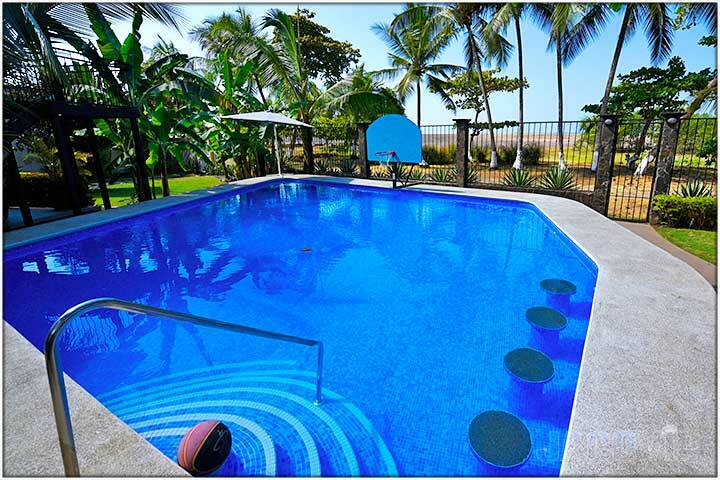 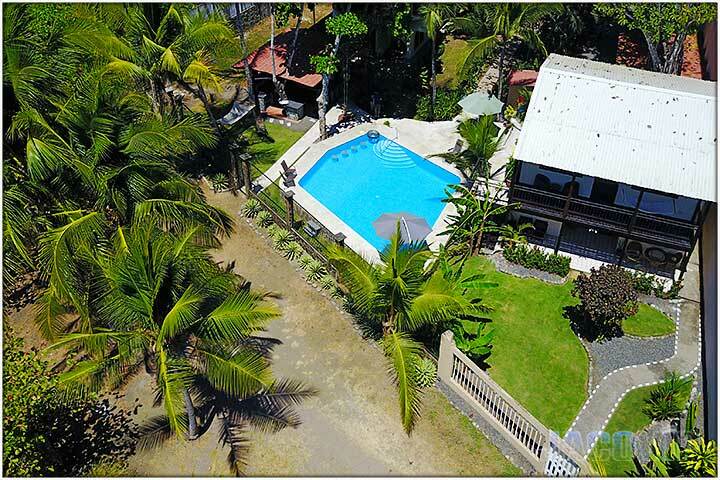 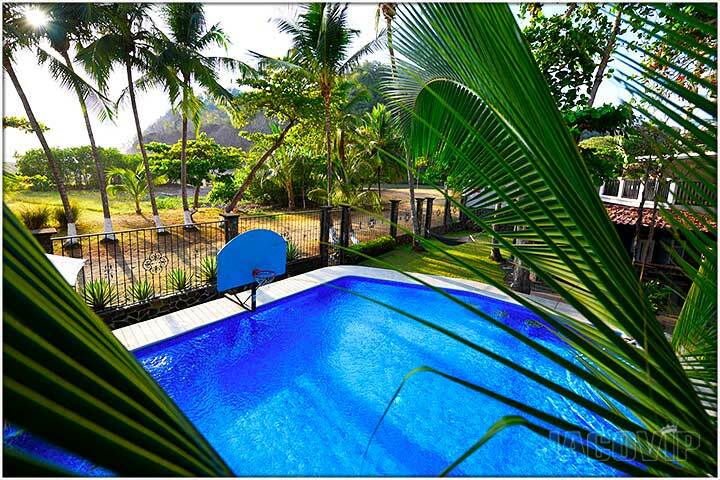 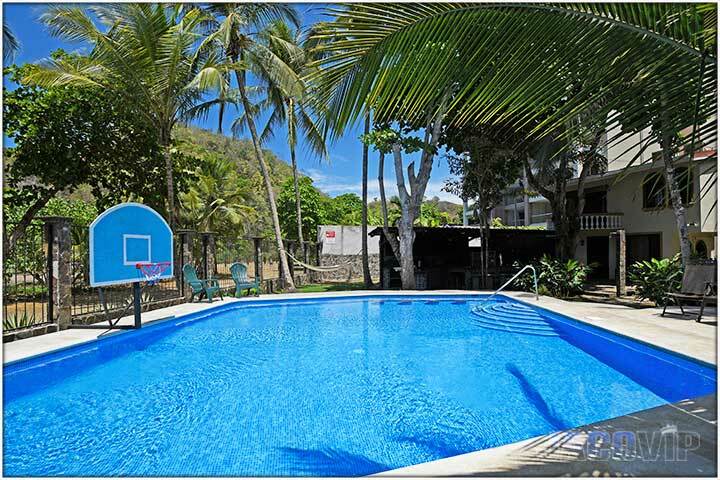 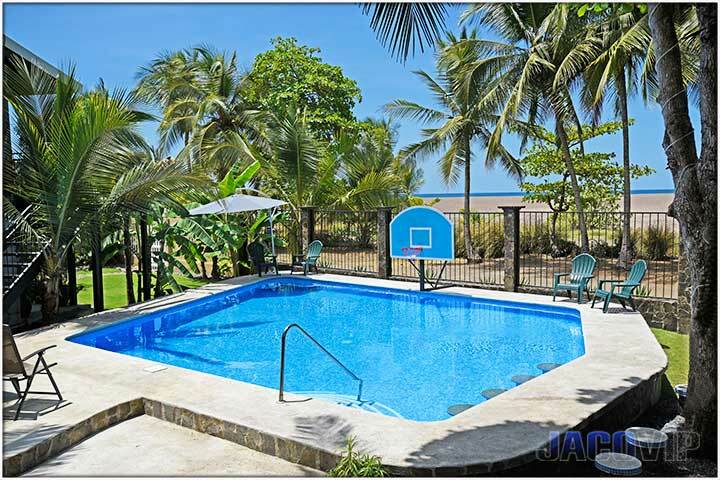 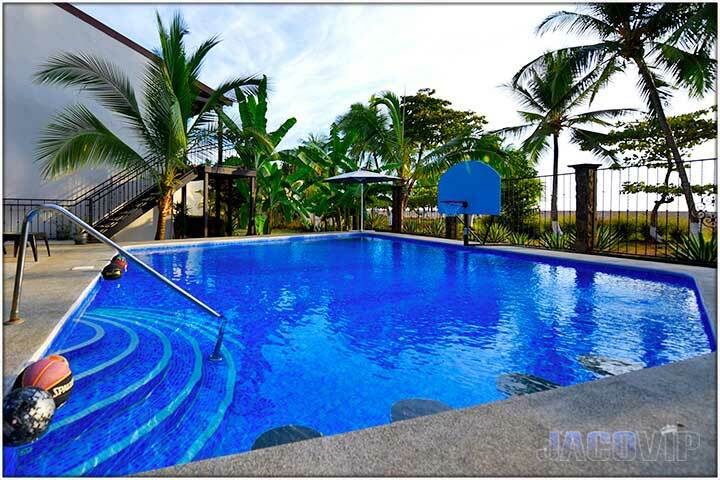 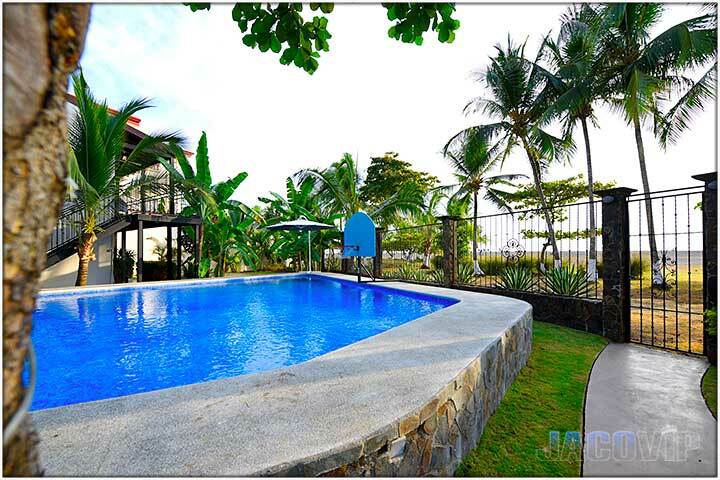 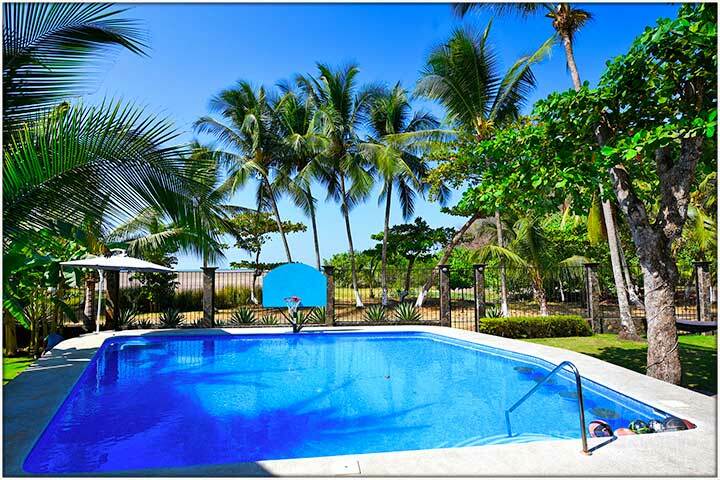 Awesome Rancho and Pool... Serenity Point is Beachfront Paradise!